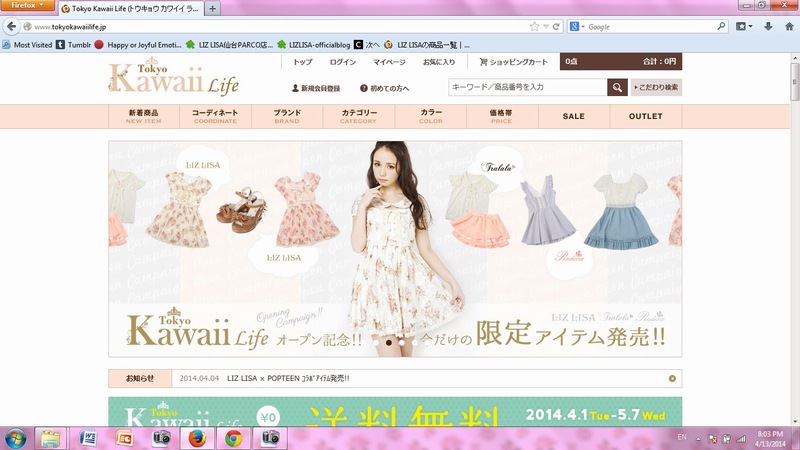 NOTE - Tokyo Kawaii Life updated their website on May 10, 2017 and it now appears differently than pictured below. I've decided to also do a picture tutorial in addition to my video how-to because this format might be easier for some people. This post is very picture heavy. Click pictures to enlarge. As Tokyo Kawaii Life does not ship overseas, you will need a Japanese address. 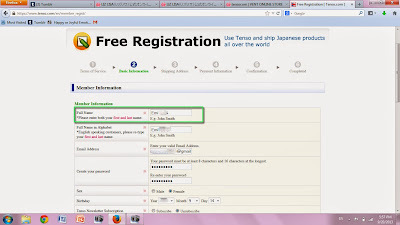 When you register with Tenso, you will receive your own, unique address at their warehouse. 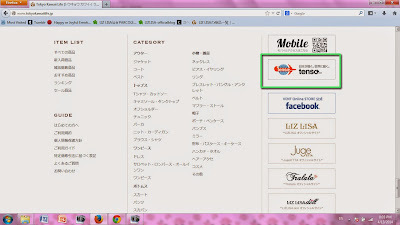 Starting from tokyokawaiilife.jp, scroll down the page and find the Tenso banner on the right. 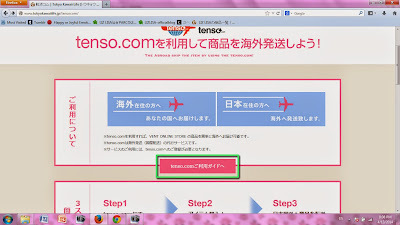 This will take you to a page which explains how Tenso's service works (in Japanese). 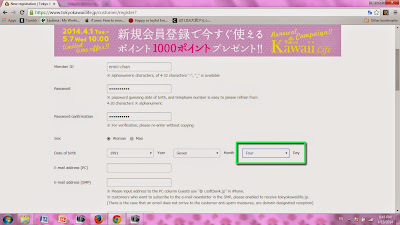 Click on the first pink button to proceed. 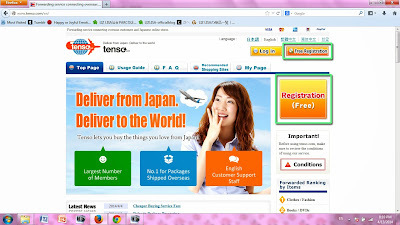 You will arrive at Tenso's Japanese homepage. 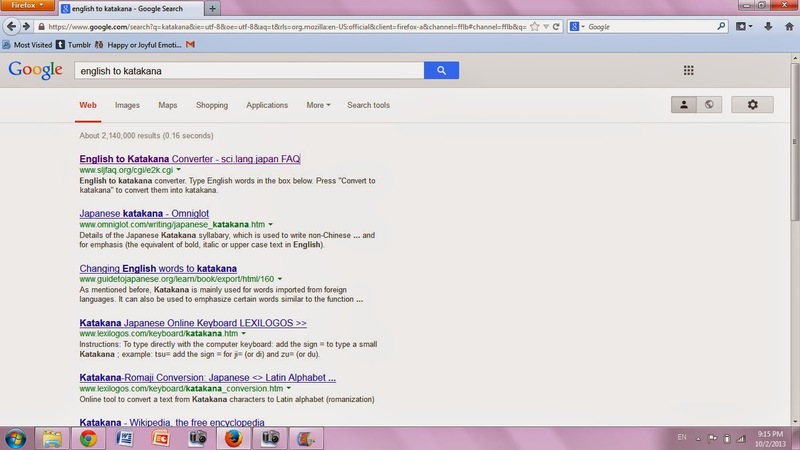 Click on "English" in the top right to be directed to the English homepage. 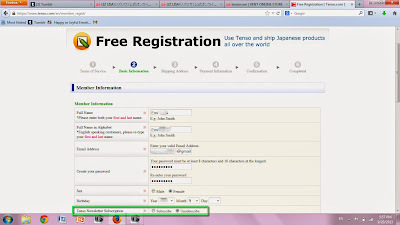 Click on either of the orange "Free Registration" buttons to get started. 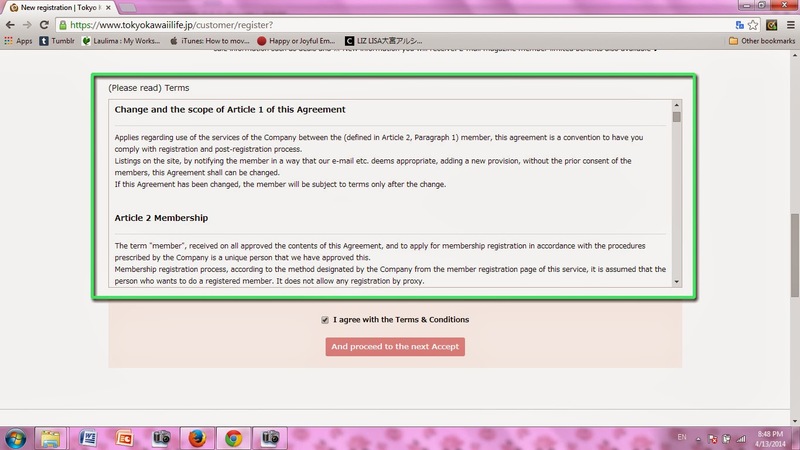 Read the terms and conditions. 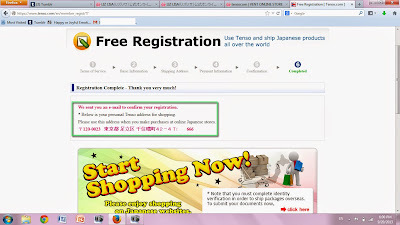 If you agree, click the "Agree and proceed registration" button on the lower right. 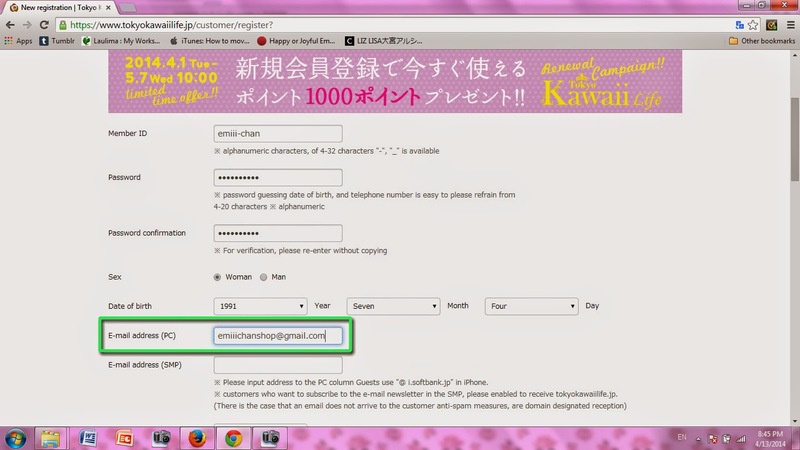 Then fill in the email address you would like to use. 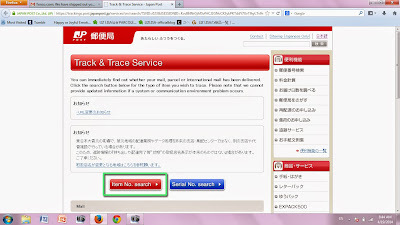 Please pick one that you check often, as email communication is important for this service. 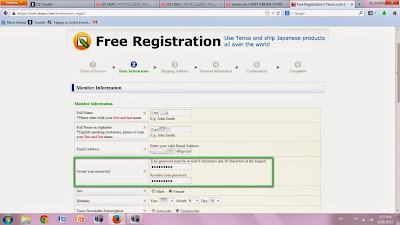 Create a password and re-enter it to confirm. 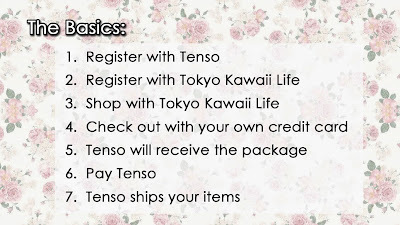 And choose your subscription preference for the Tenso newsletter. 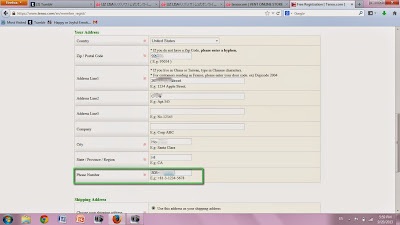 Select “use this address as your shipping address” if that is the case. 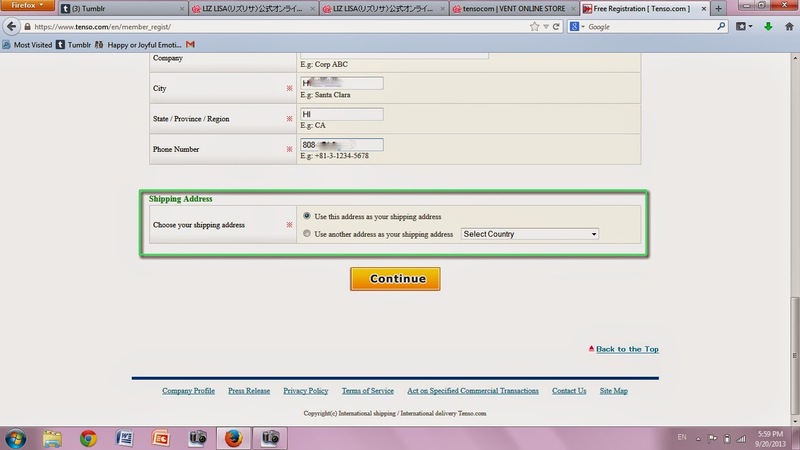 Else choose the other option and fill in your mailing address. 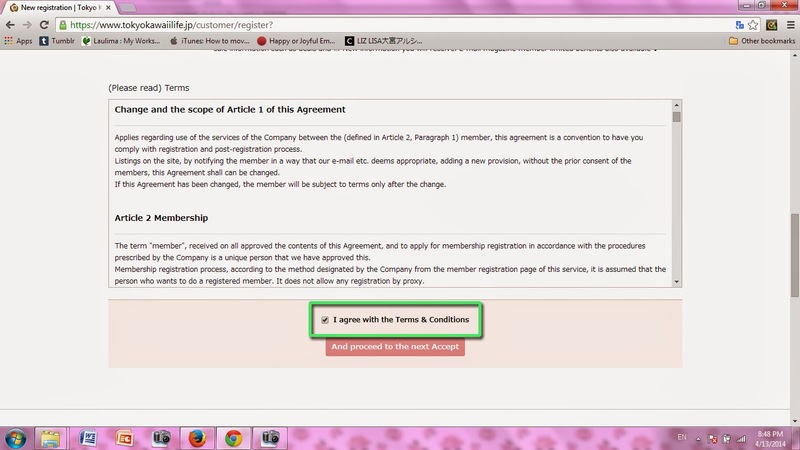 Once you have completed the form, click Continue. 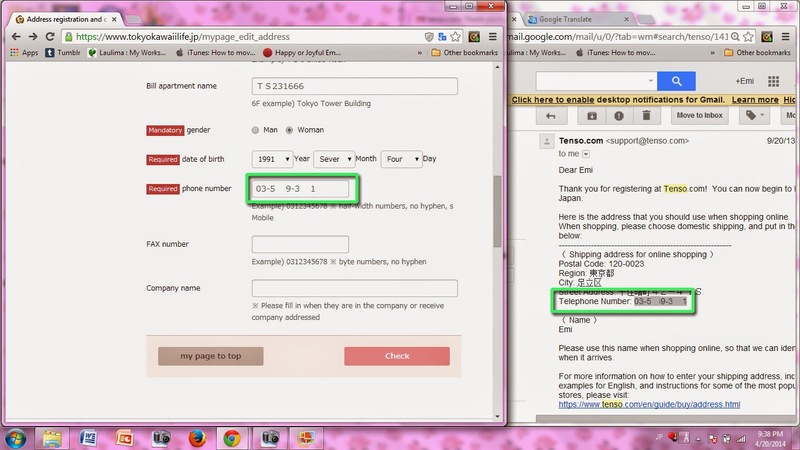 Check to be sure you have correctly entered all of your information. 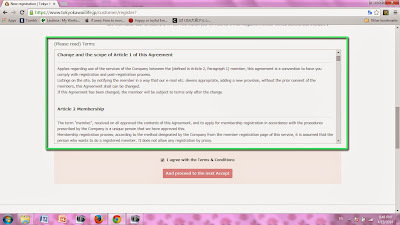 Read the bolded statements, check each box to agree. 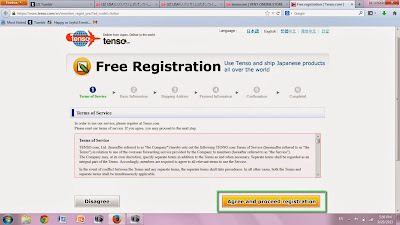 Your registration with Tenso is complete. 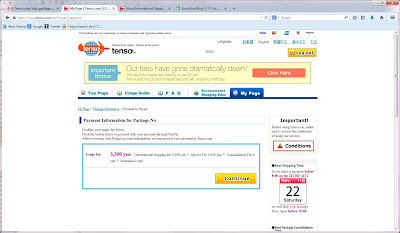 You will receive an email from Tenso including your new, unique, Tenso address broken down in parts, which can also be found at your my page at Tenso.com. 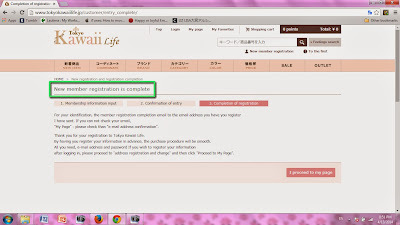 Next, you will want to register with Tokyo Kawaii Life. 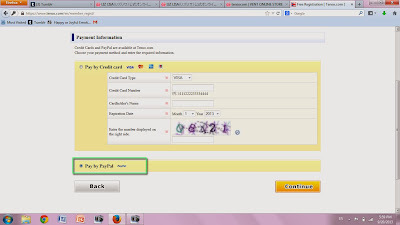 An account is necessary for ordering and is helpful because your information will be stored after entering it once, so you will not have to repeatedly go through the process. 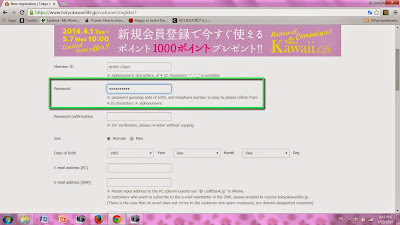 There are other advantages to registering such as being able to use the "wishlist/favorites" feature and receiving the member emails. 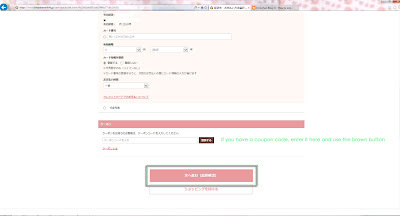 You will also only see special set/sale prices in effect for your cart when you are logged in. 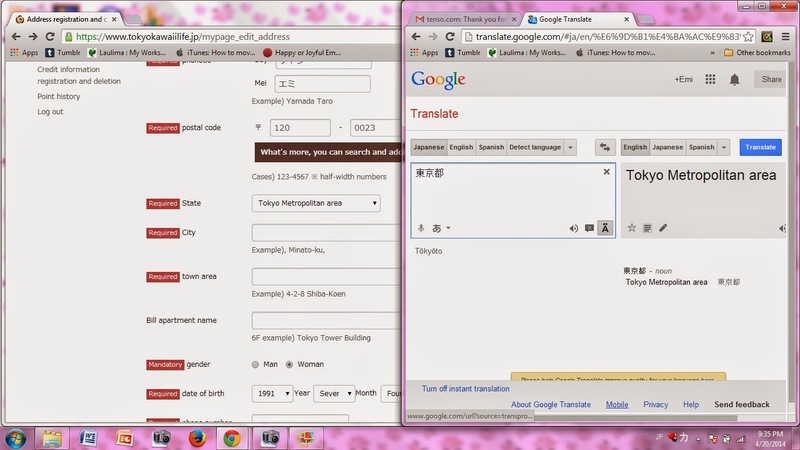 Back at tokyokawaiilife.jp, I am using Google Chrome as my browser with the automatic page translation turned on. 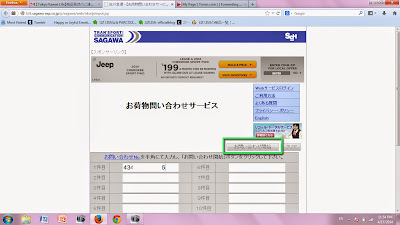 This may be a good option for you if you can't read any Japanese. 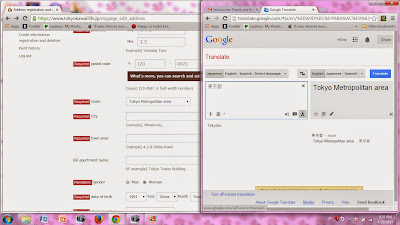 If you do not wish to use Google Chrome, you can still follow along and use my translated pages as a guide. 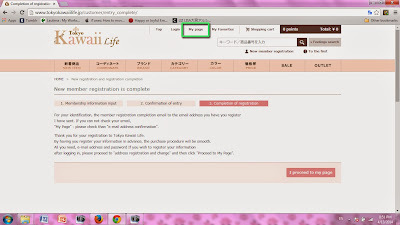 Click on the New member registration button in the upper right to start your registration with Tokyo Kawaii Life. Choose and enter a member ID. And enter your SMP email address if you have one. I don’t, so I left it blank. 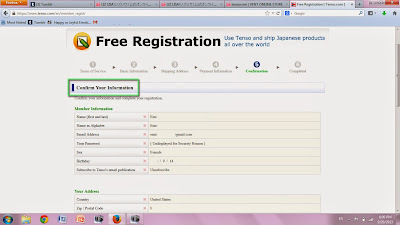 Select your state as indicated in your Tenso address - "Tokyo Metropolitan area". You may have questions about this, but hopefully it will be cleared up in a few steps when we fill in the address. Select your mail preferences. 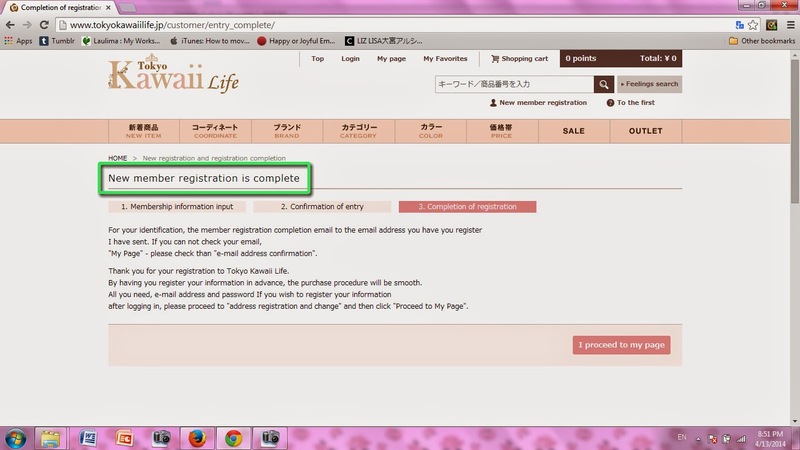 It’s my personal recommendation to sign up for Tokyo Kawaii Life emails because they often include special sale announcements or coupon codes. 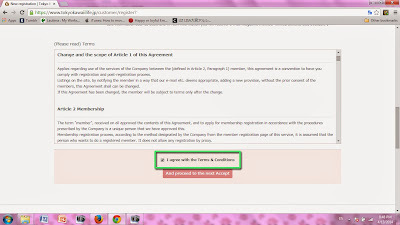 If you agree, check "I agree to the Terms & Conditions". Click the pink button to proceed. 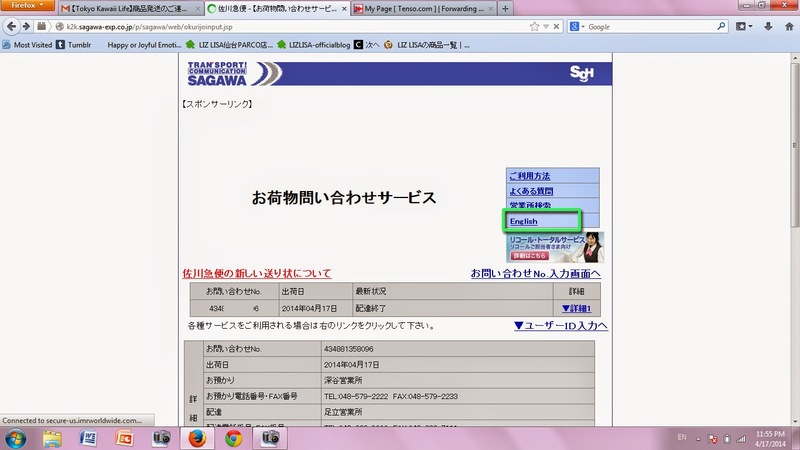 Confirm the information you have just entered. 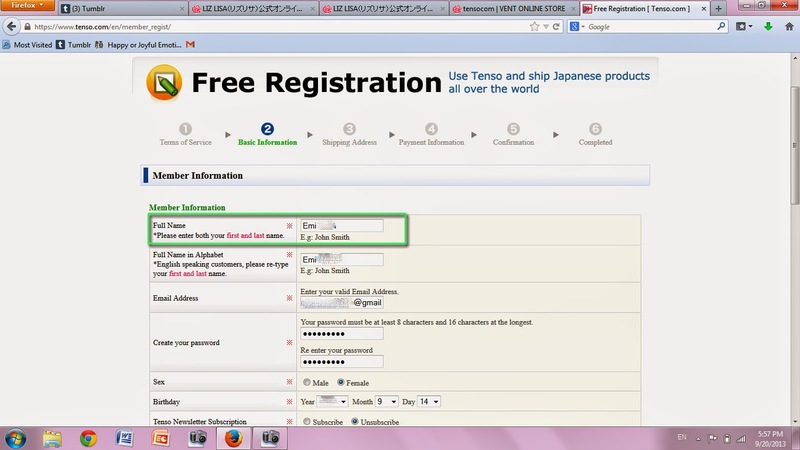 If all is correct, click "Register" on the lower right. Your registration with Tokyo Kawaii Life is complete. 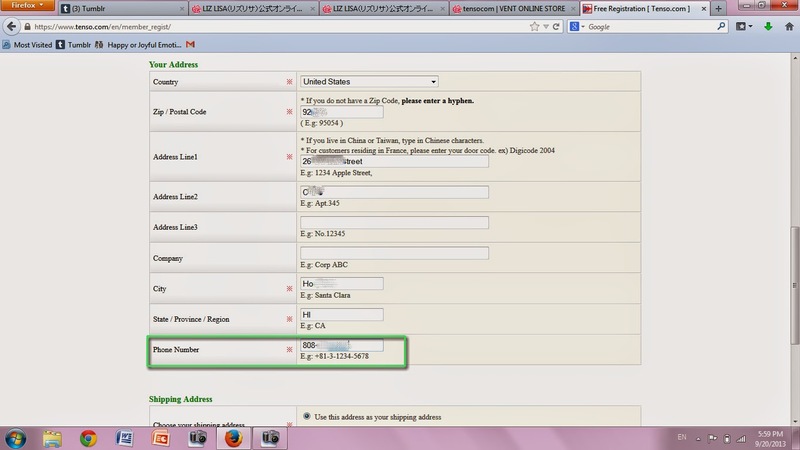 After you have established your account, it will be useful to register your address. This will make the check out process much easier if done in advance. 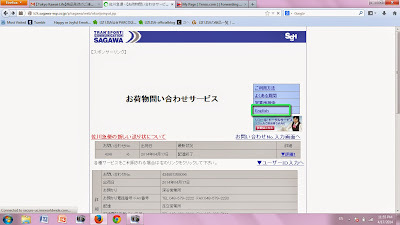 Click on the My Page button in the top navigation, third from the left. At your "My Page", click the third box from the left with the house in it , "Address registration and change". 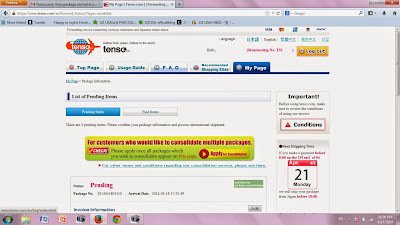 Go back to your email and find the message from Tenso with your address. 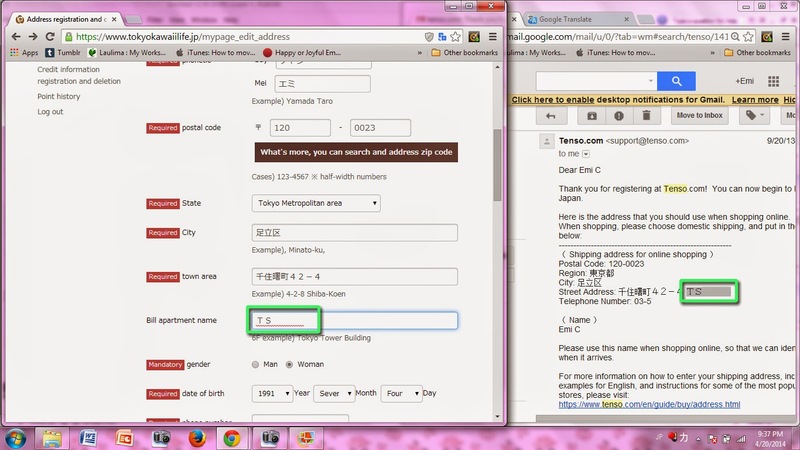 It may be helpful to have it open in another window so you can view the pages side by side. 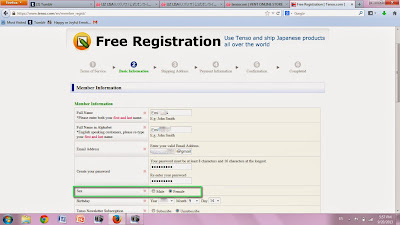 Enter your last name and first name as you entered it with Tenso. 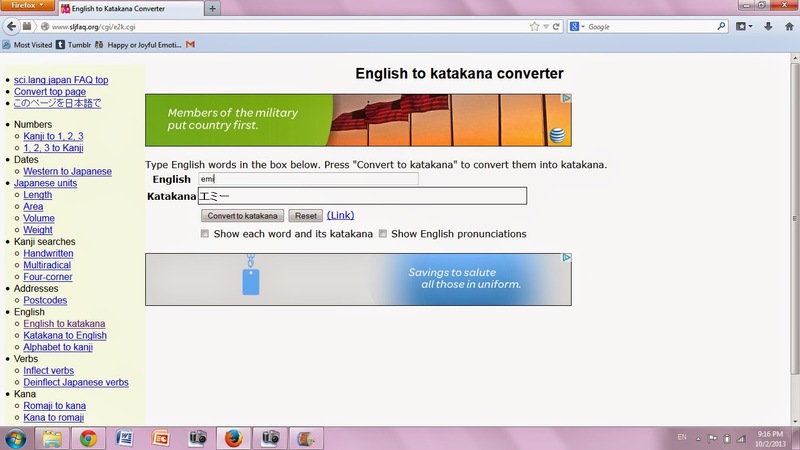 you can google to find an English to Katakana converter. 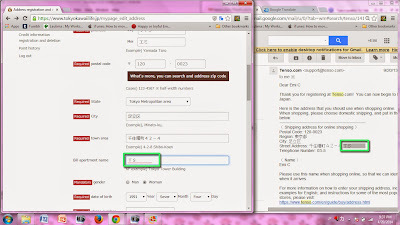 Type in your name in English and it will convert it for you. 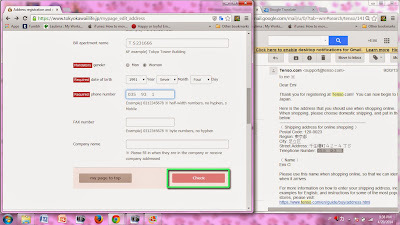 Do this for your last and first name, then copy and paste into their respective fields. 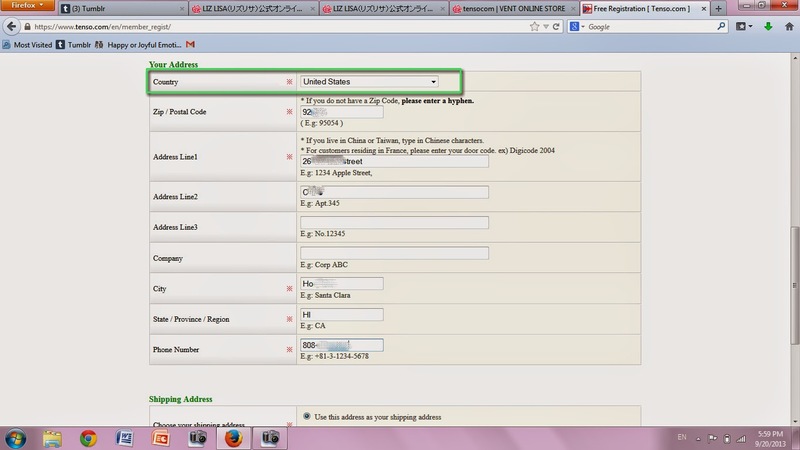 Select your state (again) as "Tokyo Metropolitan area". 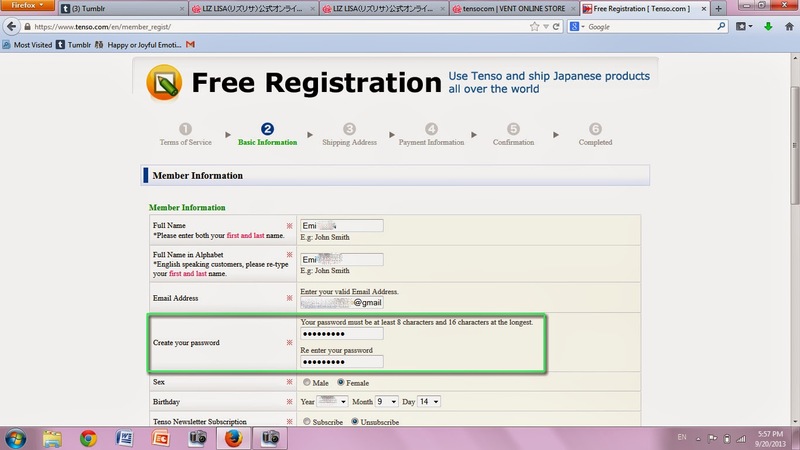 This is the labelled “Region” in your Tenso address. 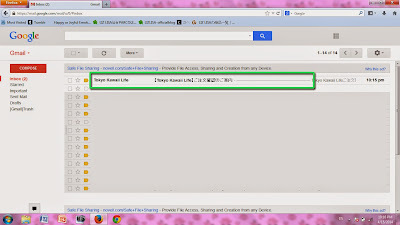 Google chrome has translated the kanji in the drop down bar. 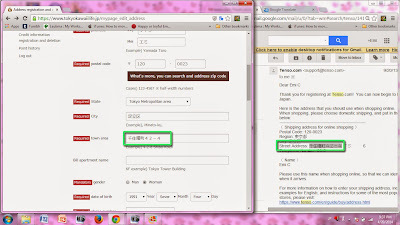 If you need confirmation, A quick copy and paste of the "Region" kanji into a translator will show you that the state is indeed "Tokyo Metropolitan area" when translated. 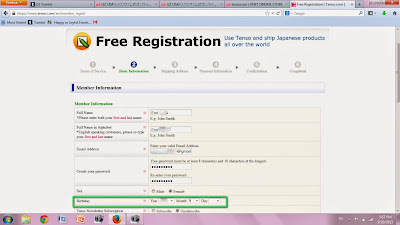 Copy and paste the "City" field from Tenso to the "City" field for Tokyo Kawaii Life. 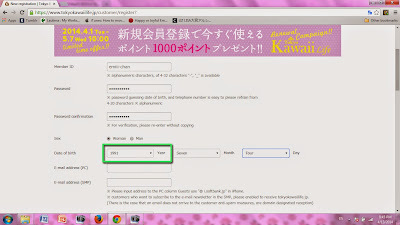 Copy the first half of the "Street Address" field for Tenso (stopping before the TS number) and paste into the "Town area" field for Tokyo Kawaii Life. 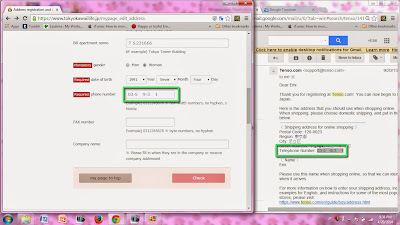 Copy the TS number for Tenso and paste into the "Bill apartment name" for Tokyo Kawaii Life. Your gender and date of birth should already be filled in. If that is not the case, provide the information. 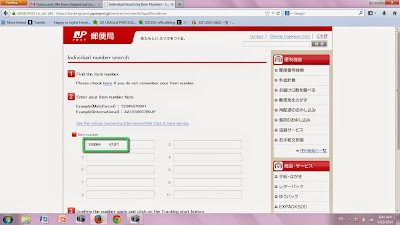 Copy your "Telephone Number" from Tenso, and paste into the "Phone number" field for Tokyo Kawaii Life. 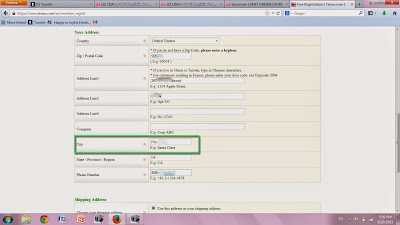 Delete the hyphens from the phone number. 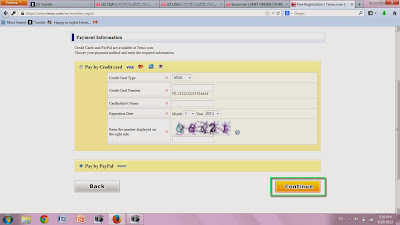 Click the "Check" button in the lower right. 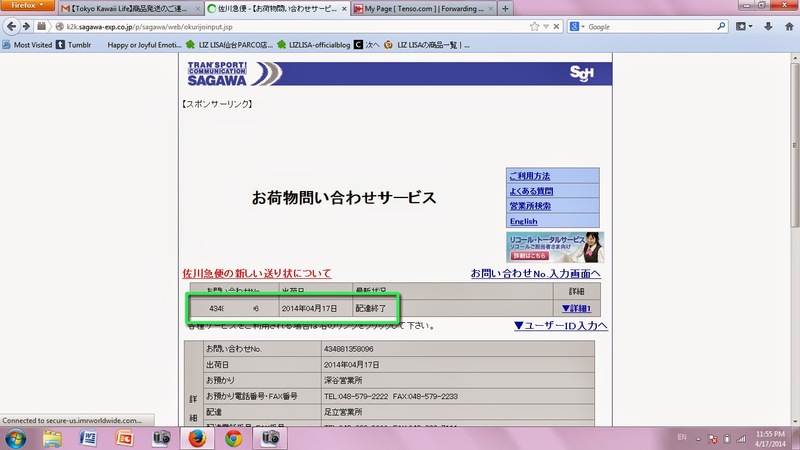 Confirm that the information you entered was correct. 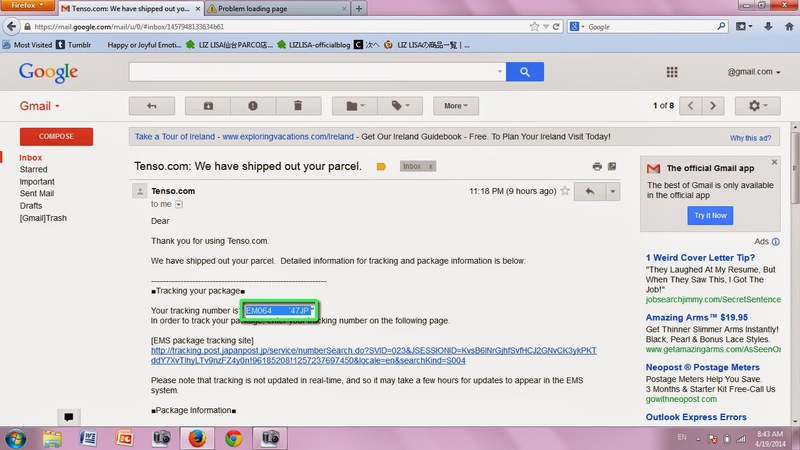 Your shipping address is an important part of the process. 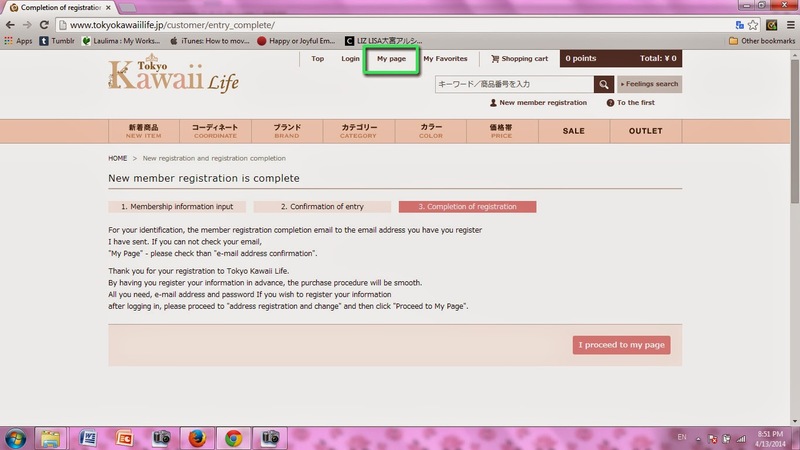 Your address registration with Tokyo Kawaii Life is complete. Time to shop! 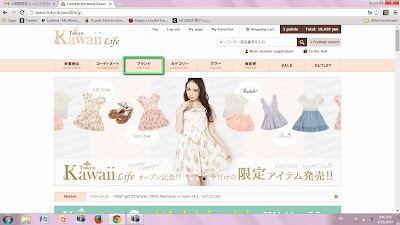 From the Tokyo Kawaii Life home page, there are many different ways to navigate and shop with the pink navigation bar,such as "New Item", "Brand", "Category", "Color", "Price", "SALE" and "OUTLET". 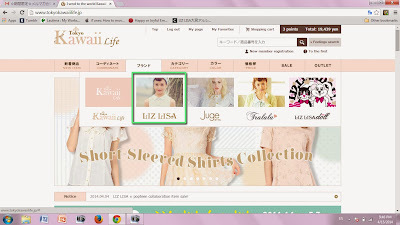 You can explore the website yourself, but for the purposes of this tutorial, let's start by visiting the Liz Lisa shop specifically. 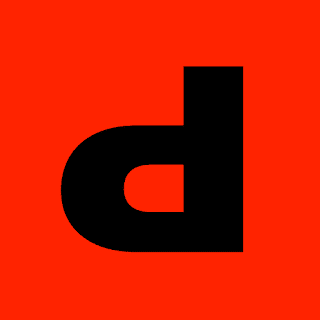 Hover over the "Brand" category. 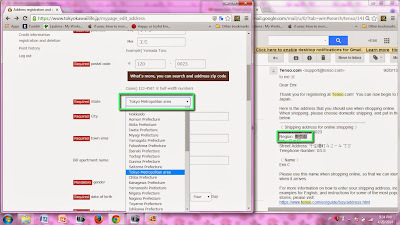 Your options with appear. 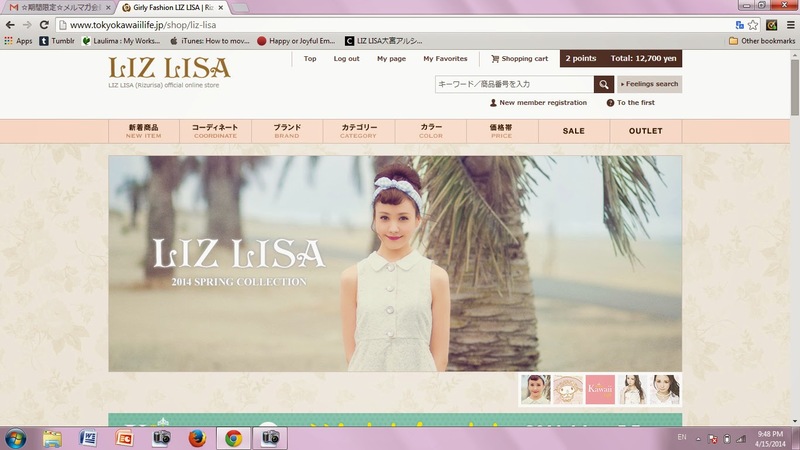 Click on the Liz Lisa icon. 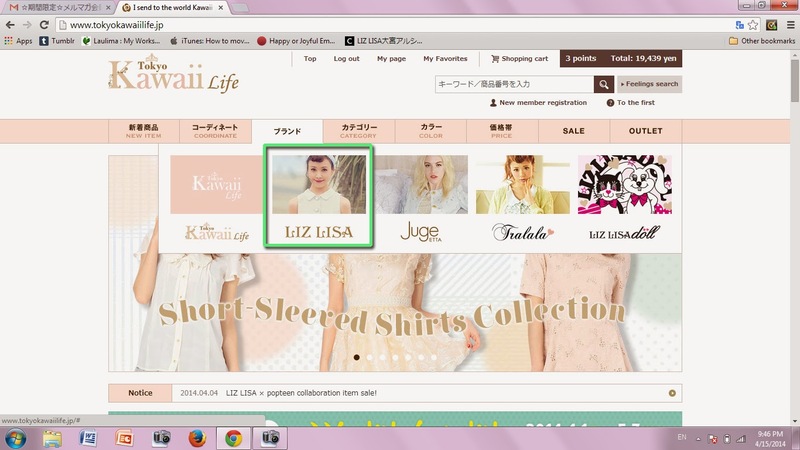 You will arrive at the Liz Lisa section of Tokyo Kawaii Life where you will find only items from the Liz Lisa brand. You can browse by category and type of clothing or goods, such as "Tops"
If you see an item you are interested in, click on the picture to take you to the listing. Here you will see other stock photos, color options, and the item description and measurements (not all pictured here). If you plan to purchase this item, click on the "I Add To Cart" button associated with the color option in which you are interested. 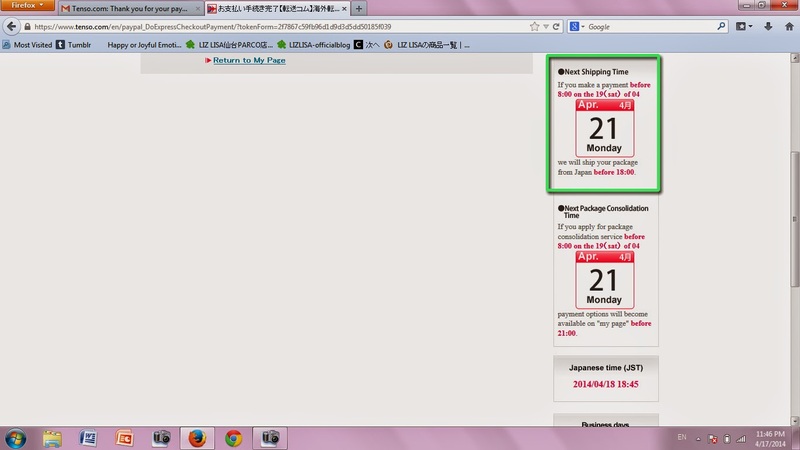 If the colorway is sold out, the icon will look differently and of course the item will not be placed in your cart. 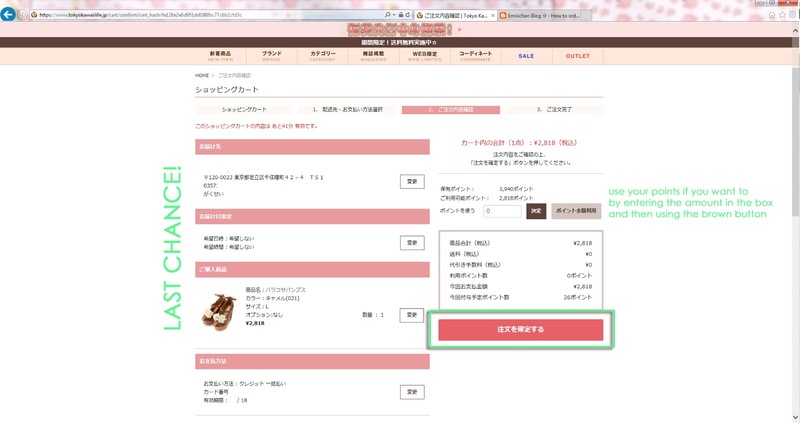 If the item is in stock, a screen with your cart contents will pop up. 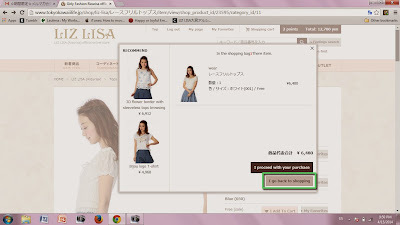 Click on the bottom button to continue shopping. 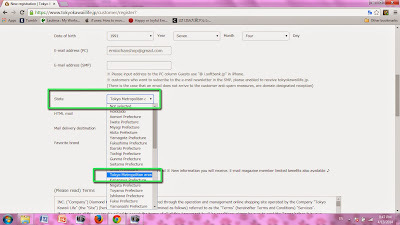 You are able to shop with any or all of the VENT brands and purchase with one transaction. Let’s say you want to check out the items from Tralala. Click on the Tralala icon. 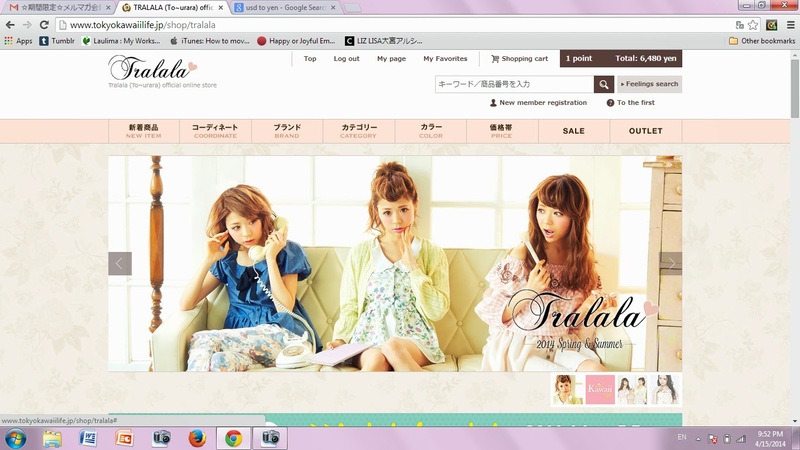 You will be directed to the Tralala section of Tokyo Kawaii Life where you will be shown only items from the brand Tralala. If you find an in-stock item you are interested in, add it to your cart. 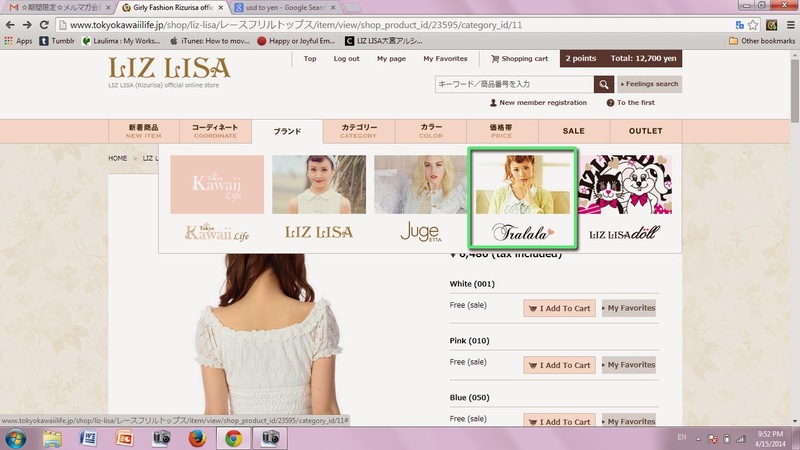 As you can see, you are able to have items from both Tralala and Liz Lisa in your cart together. 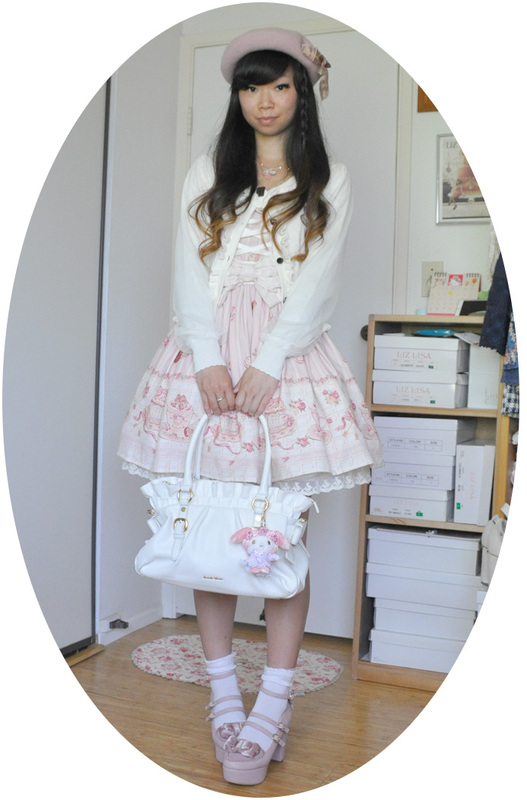 This goes for any combination of any of the brands available through Tokyo Kawaii Life. 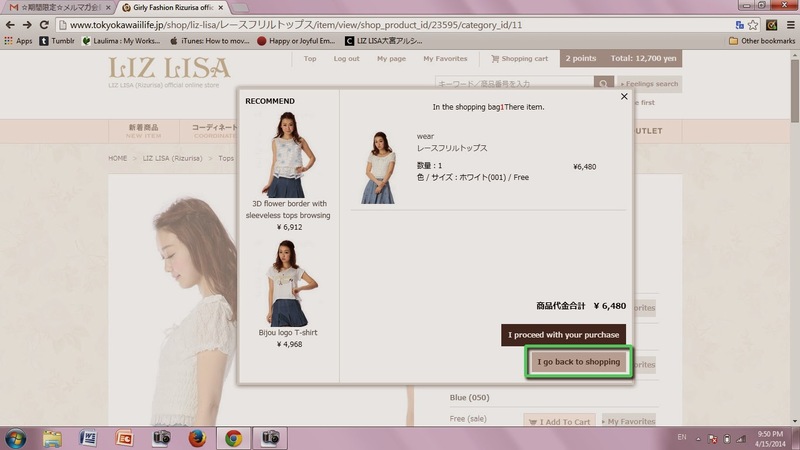 When you have added all desired items and are ready to check out, click "I proceed with your purchase". 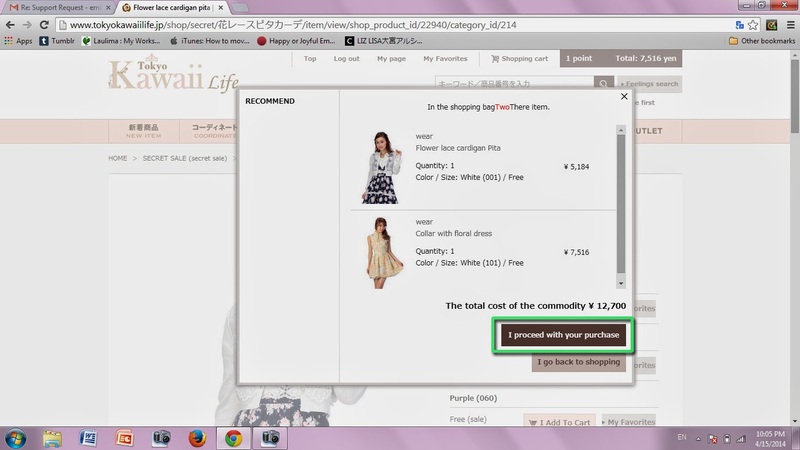 This will take you to a more detailed version of your cart where you are able to take out items or increase the quantity if necessary. 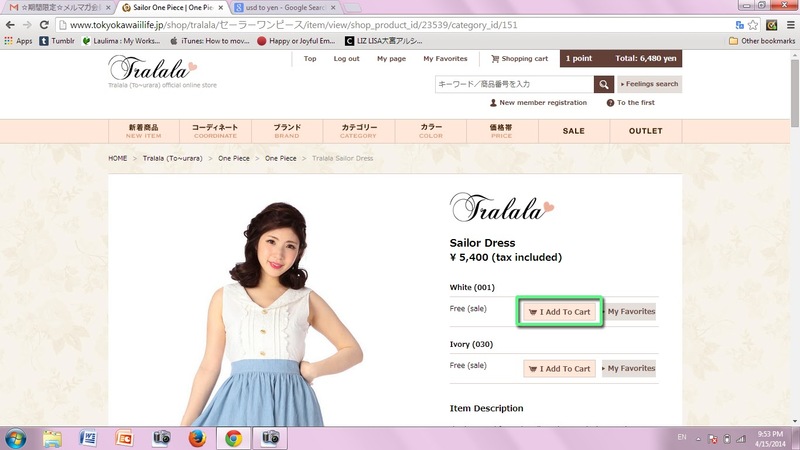 Once you are happy with your cart contents, click on the pink "Proceed to your purchase" button in the lower right. 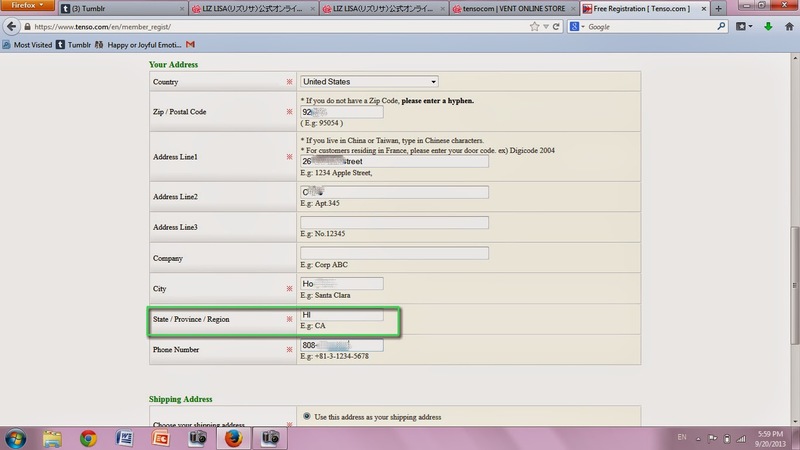 Select your shipping address. 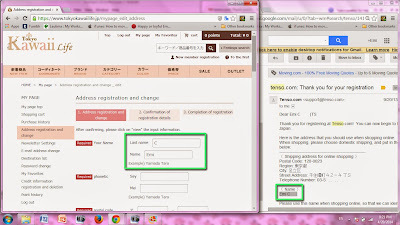 Since you already registered it, your Tenso address should already be there, and you need only to double check it and make sure it is properly selected. 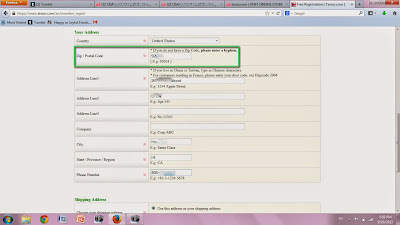 Below your address, you have the option to select a desired date and time for delivery. 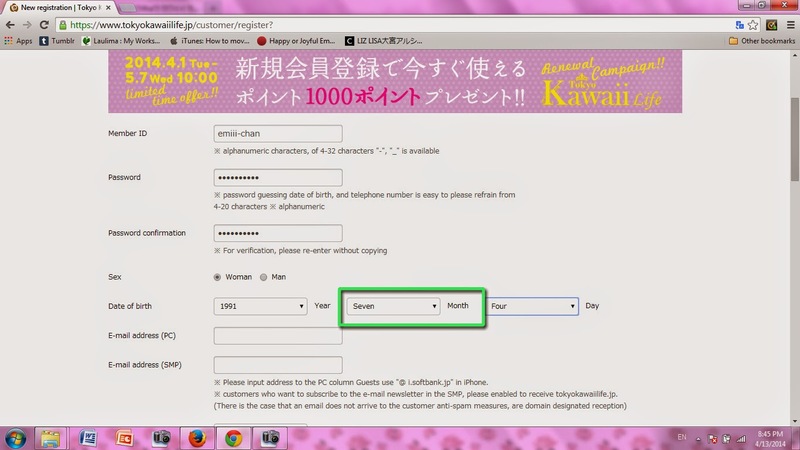 (I think the default is the second option which asks for a date.) 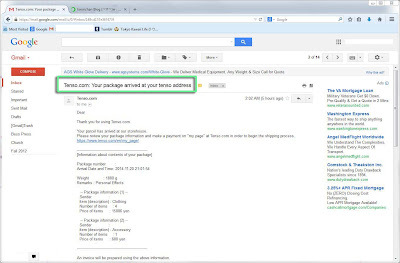 You should select the first option which essentially says "Do not want" and this will have the package delivered as quickly as possible. 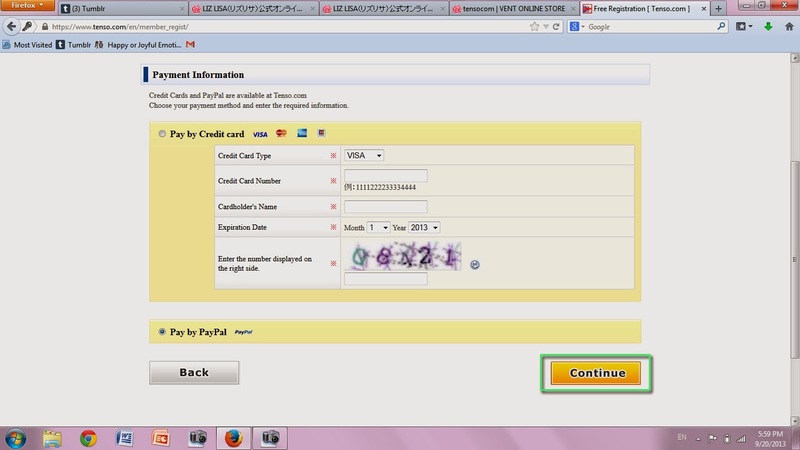 Next, you will enter your payment information. 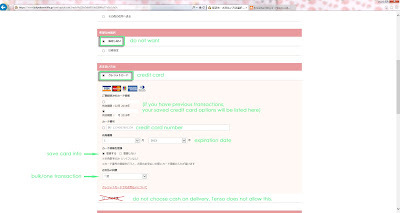 Your Payment Method must be selected as "Credit card".Enter your card number and expiration date. 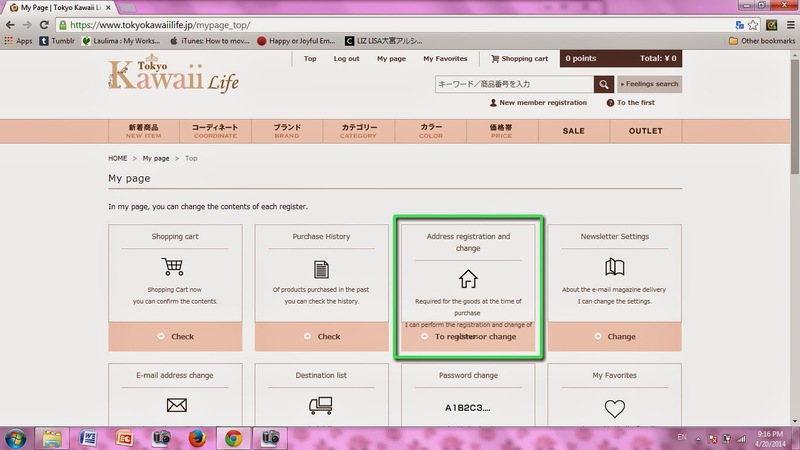 You can choose to "register"/save, your card to your account if you prefer, so that you won’t need to input the information again for your next order. 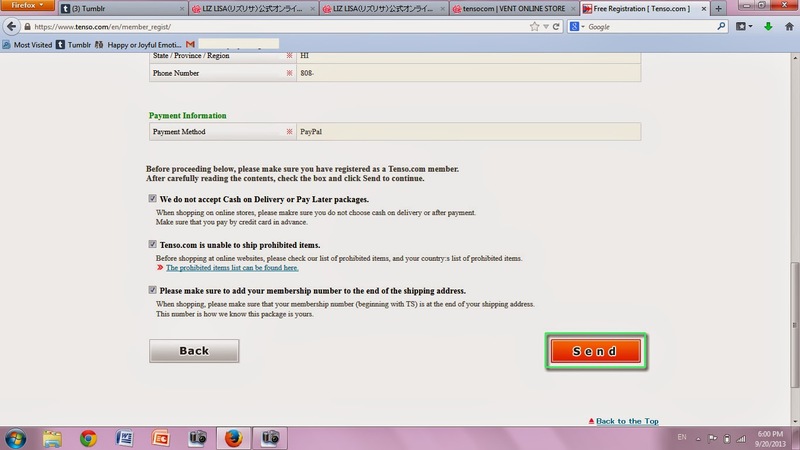 Do NOT select "Cash on delivery" as Tenso does not allow this. At the top right corner, I have points available for use because I have purchased in the past. 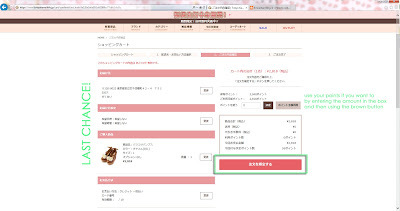 If you are a return customer, enter the points you wish to use and click the left brown button. If you are a first time buyer, you probably don’t have any and should skip this step. Review the information on the page and check to be sure that all the information is correct. 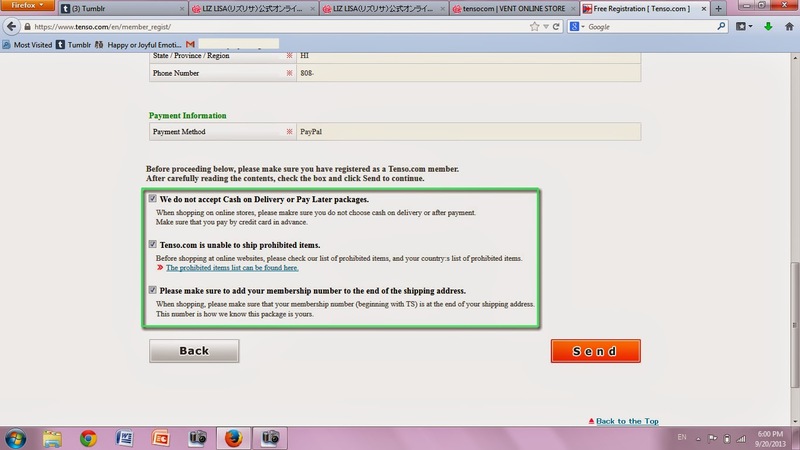 The price for domestic shipping should also be included here (if applicable. 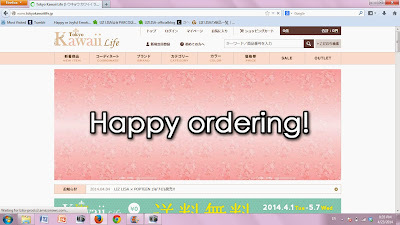 Tokyo Kawaii Life has certain time periods where they will do a free shipping promotion). This is your last chance to go back and correct anything before your order is submitted. Orders with Tokyo Kawaii Life cannot be cancelled so please be sure of what you are purchasing! 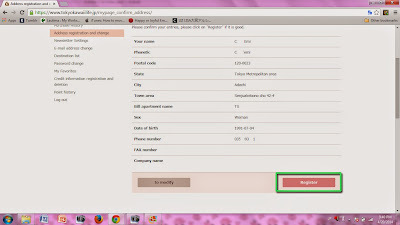 When you are satisfied that all the information is correct, click on the pink button on the right to complete your transaction. The check-out process is now complete. 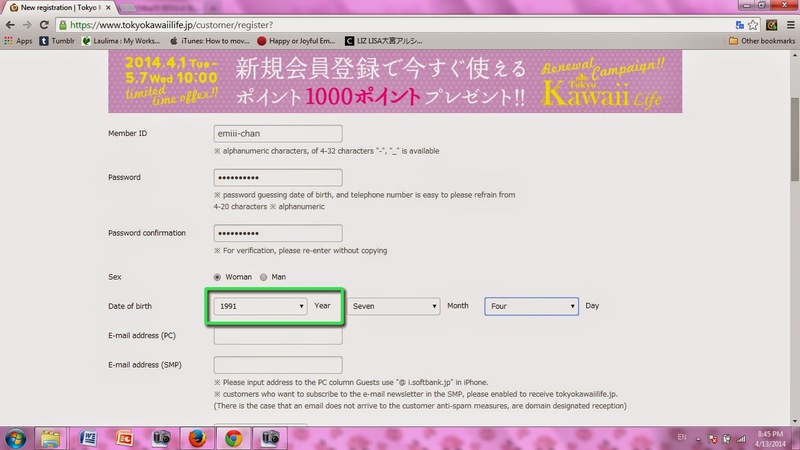 Shortly after, you will receive an email confirmation from Tokyo Kawaii Life. 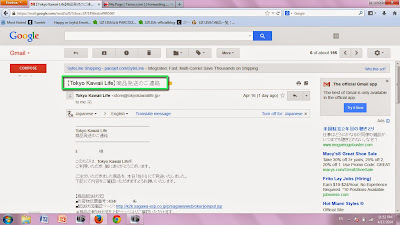 I used Gmail's "Translate message" option because the email is in Japanese. 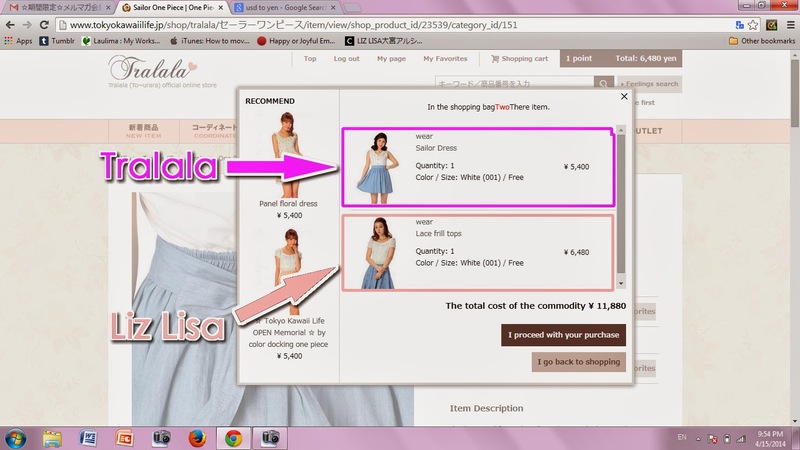 It basically shows you the details of the order you just completed. 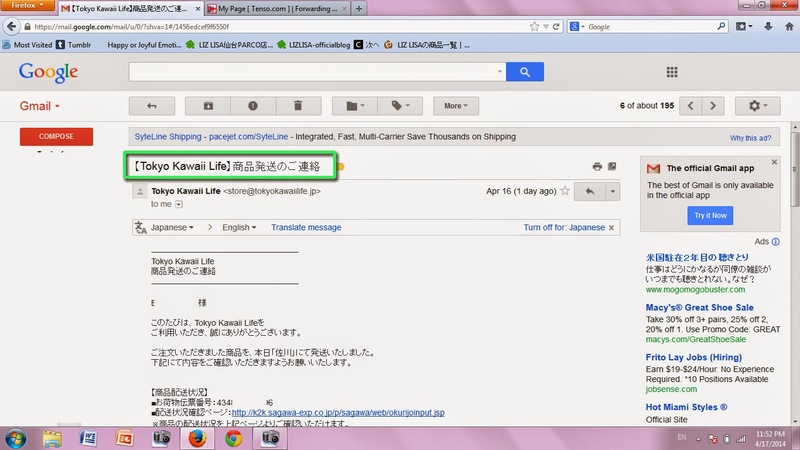 After about one business day, you will receive another email from Tokyo Kawaii Life to notify you that your order has been shipped (within Japan). It may take longer depending on the season and whether you are purchasing during a major sale period. 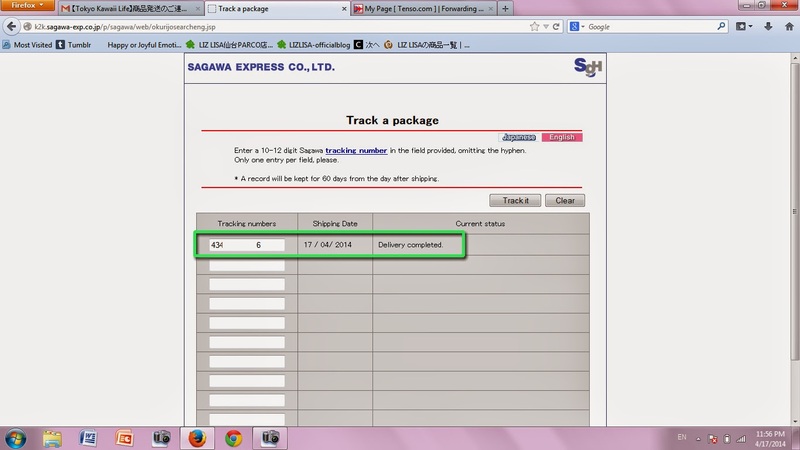 This email includes shipping information such as the tracking number with Sagawa Express. 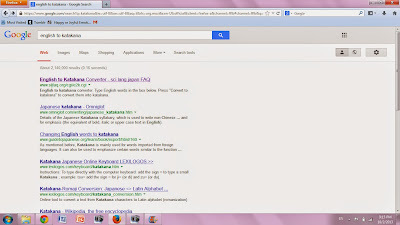 clicking on the link provided below that. 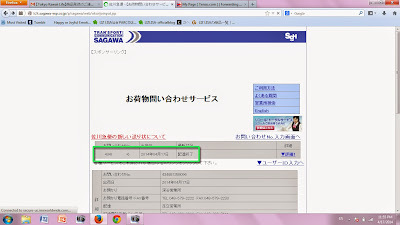 You will directed to the Sagawa Express tracking site. 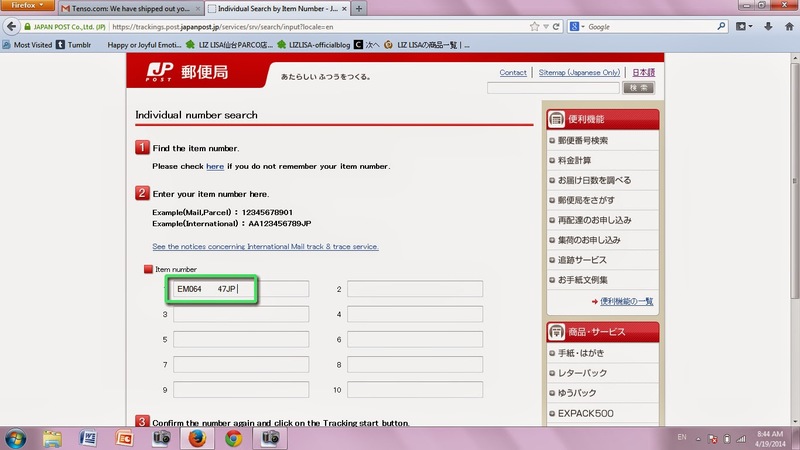 Paste the number into the first slot and click the longer button on the right to search. 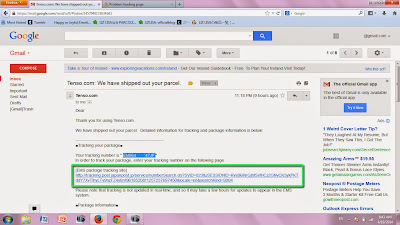 Here is your package information. 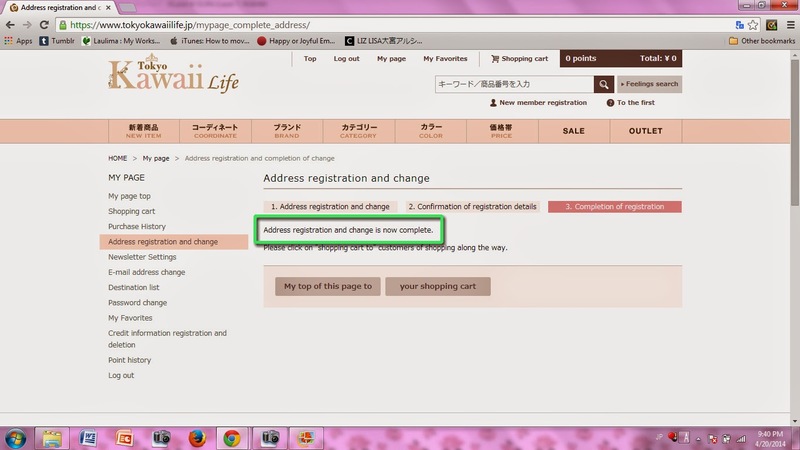 If you need this information in English, click "English" on the right. 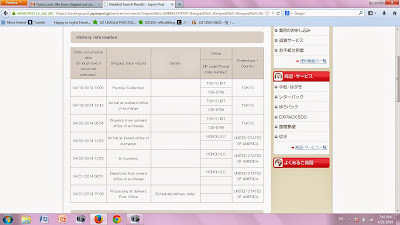 Here is your package information in English. 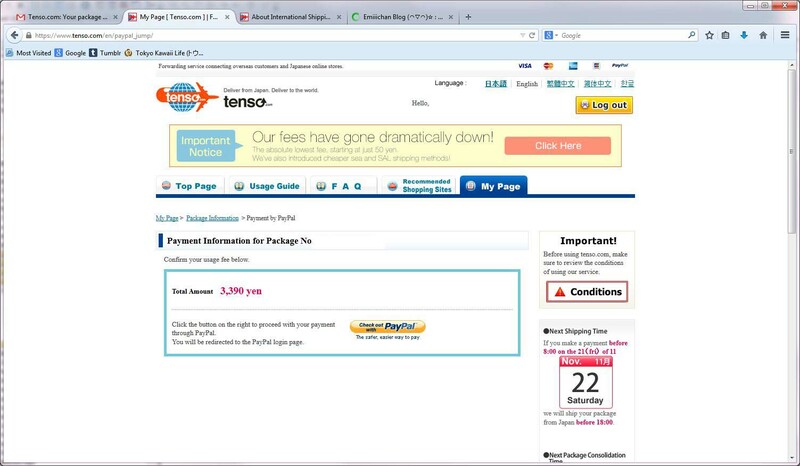 After you make your purchase, you do not need to notify Tenso to expect your package. Tenso will dutifully contact you via email when they have received it and finished the initial processing. UPDATE! 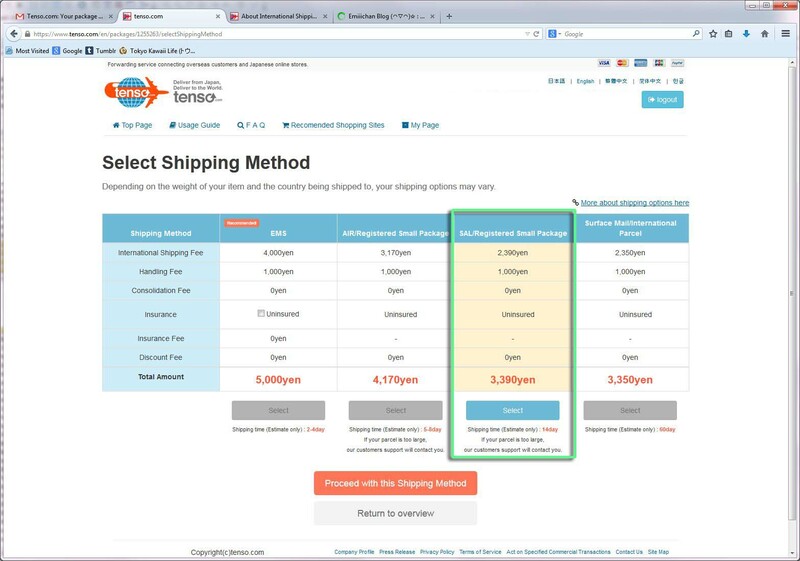 As of mid-November 2014, Tenso has initiated new shipping options and rates! I will make edits/screenshots when I can, but the basic process is reasonably the same, and I think most of you will be able to get through this part of the process on your own without a very specific step-by-step. 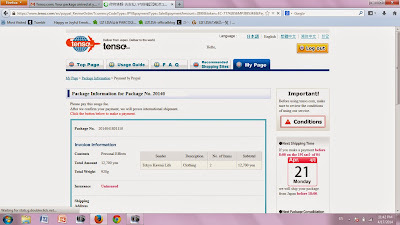 This is the email you will receive from Tenso when your package has arrived at their warehouse. 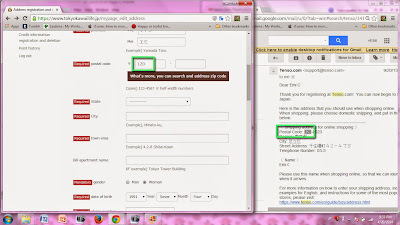 Find the link to go to the login page. 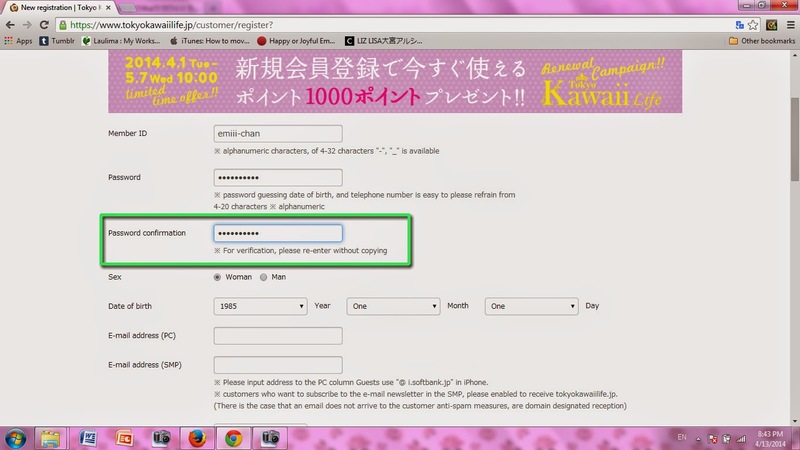 Enter your email address and password, then click "Log In". 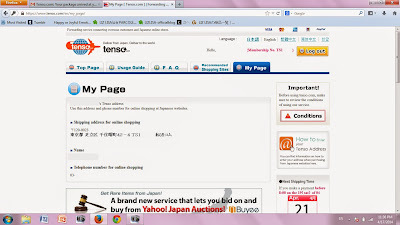 You will be directed to your Tenso "My Page". 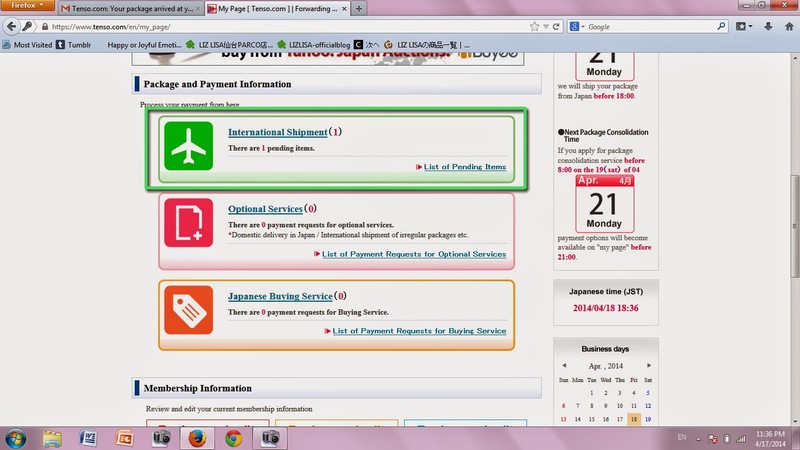 Under "Package and Payment Information", you should see that you have one item pending for international shipment. 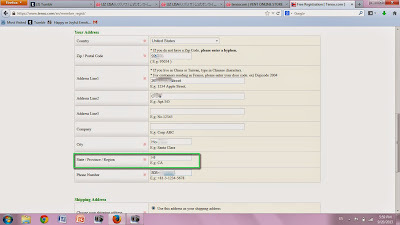 Click on that option. 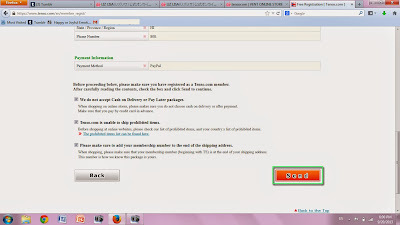 You will arrive on a list of pending items. 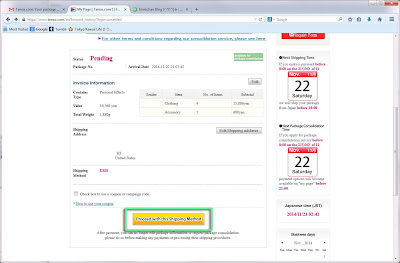 Review the information such as sender, number of items, subtotal and your shipping address. The default listed Shipping Method is "EMS" which is Tenso's recommended method. You do not have the option to change it on this screen. 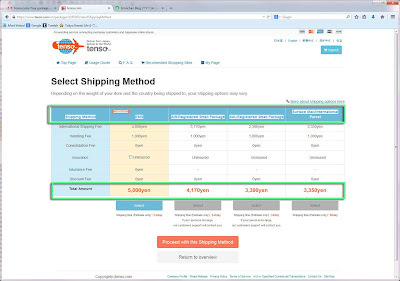 Click on the "Proceed with this Shipping Method" button to move to the next screen where you will actually get to pick. You will be shown a table with the different shipping methods and their prices with a breakdown of the service fee as well. 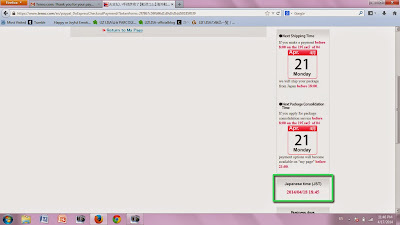 The estimated shipping time is listed below the Select button. 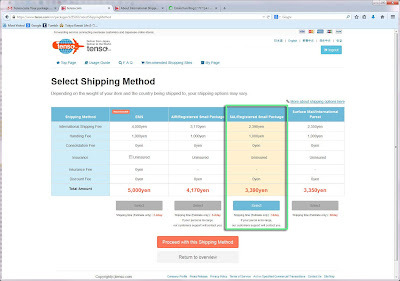 Select which shipping method you'd prefer. In this case, I picked SAL (Small Package). Estimated shipping time was 14 days and it was about $16 cheaper than EMS. Since I wasn't in a rush to get my package, I decided this was a good deal. 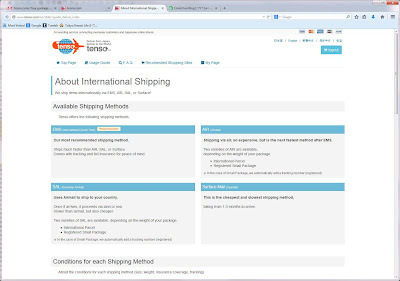 Once your preferred shipping method is selected, click on the orange "Proceed with this Shipping Method" button. 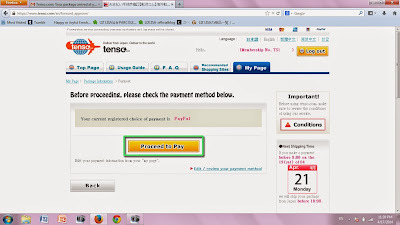 Confirm that you will be pay the usage fee as shown by clicking "Continue". 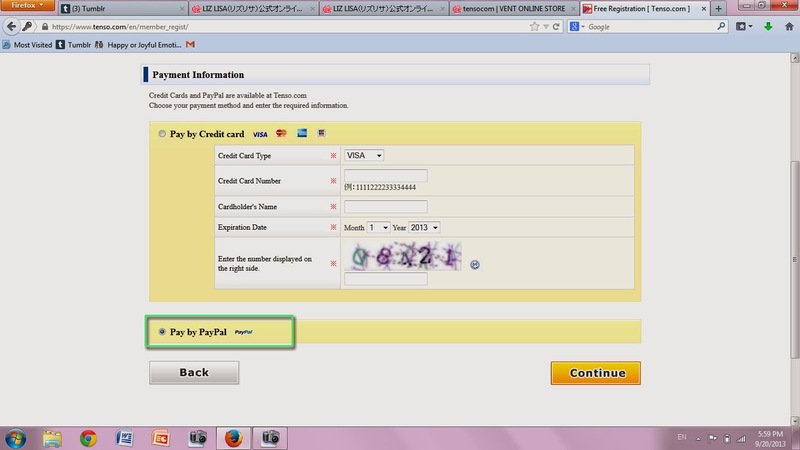 If you are also using PayPal, click on the "Check out with PayPal" button. 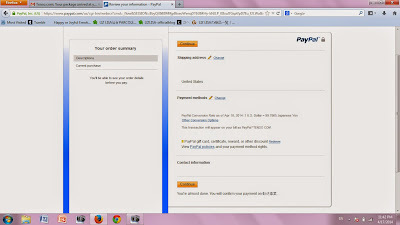 Sign into your PayPal account, check your preferences and click "Continue". Review your information one last time. 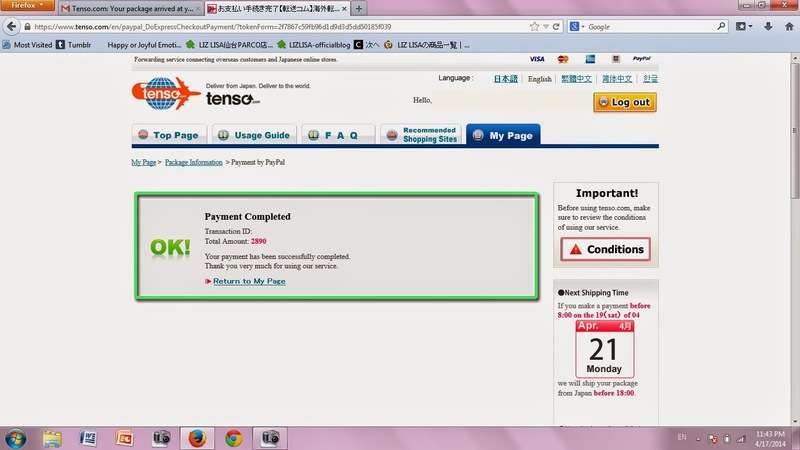 Your payment to Tenso is complete. 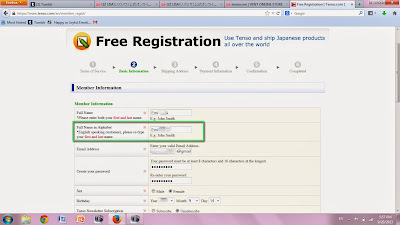 You will receive an email from Tenso confirming your payment and telling you that they are preparing to ship your package. 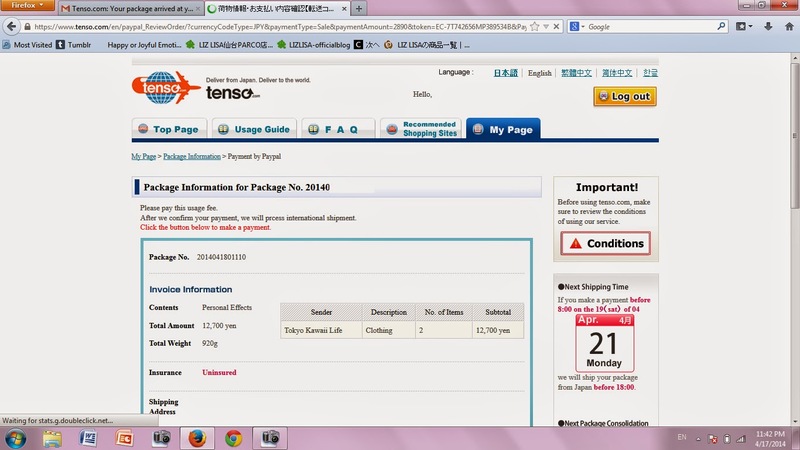 If you want to get a better idea of when exactly your package will be shipped, go back to the Tenso window. 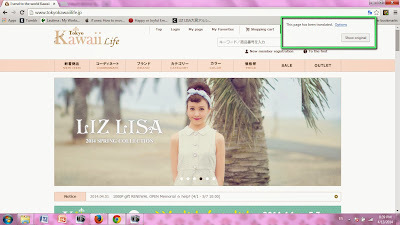 If you have closed it, you may need to log in again to get to your My Page. 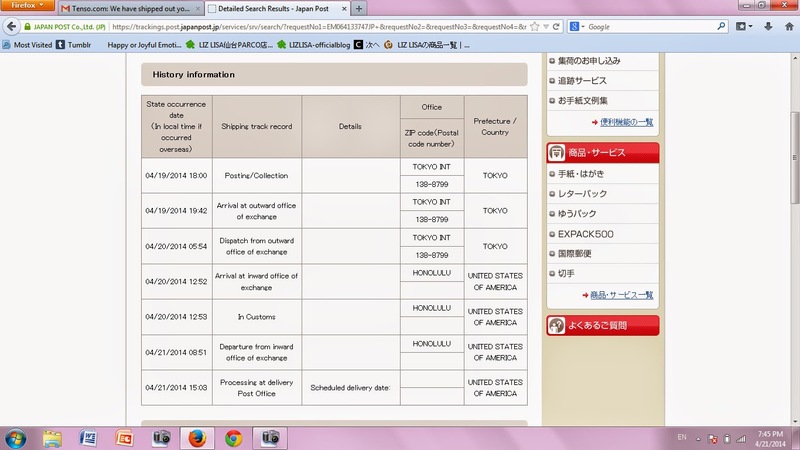 On the right, look at the Next Shipping Time. 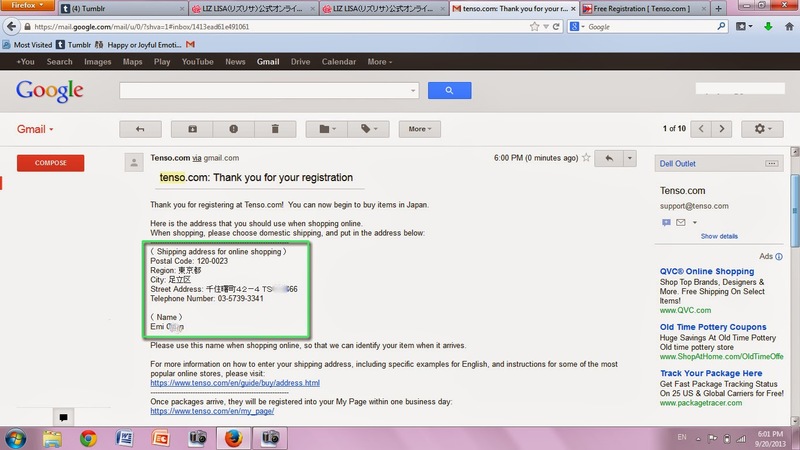 I made a payment before 8:00 on April 19th, so Tenso will ship my package from Japan before 18:00 on April 21. 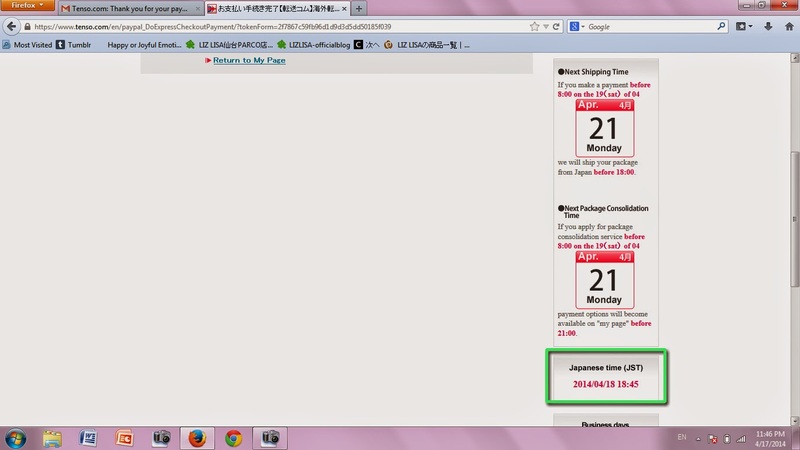 If you want to know what time and day it is in Japan, Tenso also provides that information for you. 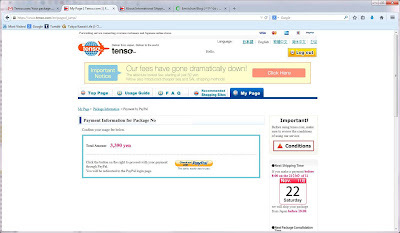 The next email you will receive will be from Tenso alerting you that they have shipped your package. 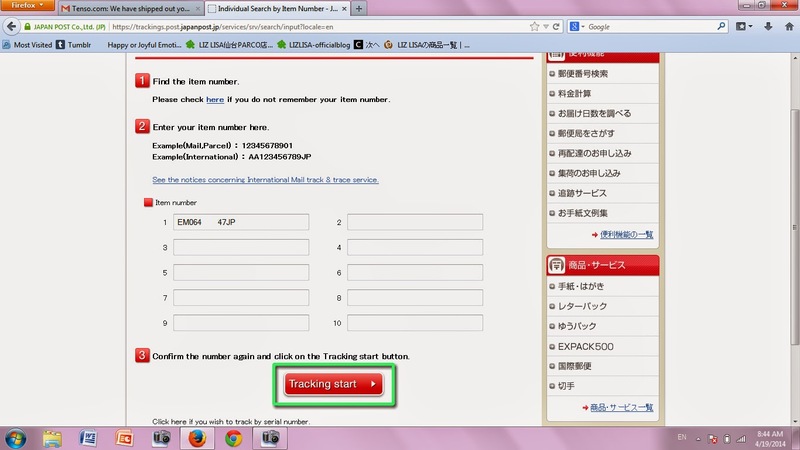 If you wish to track your package from Tenso to your mailing address, copy the tracking number provided. 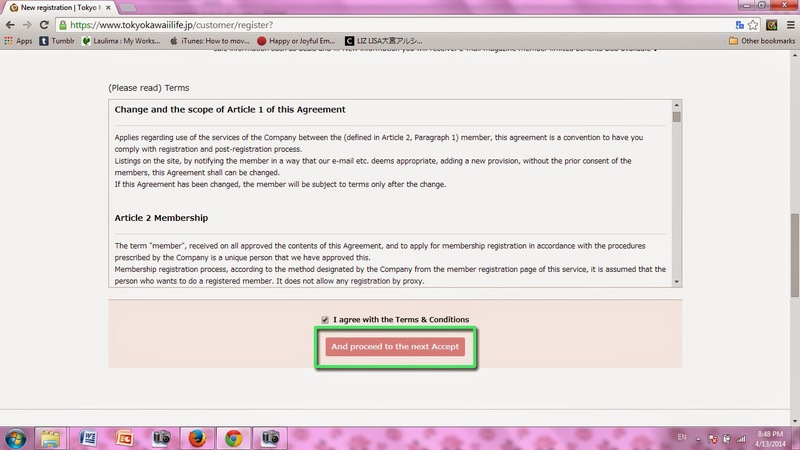 Click on the red "Item No. Search" button. 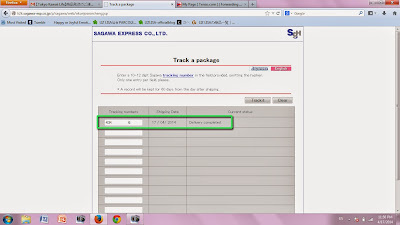 Paste your tracking number into the first slot. Click the red "Tracking start" button to search. 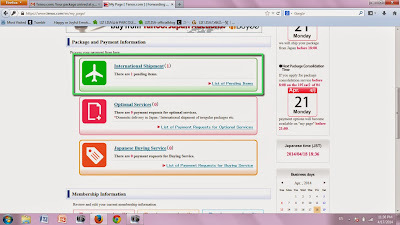 It typically takes around 4-5 days for me to receive my package from Tenso with EMS. 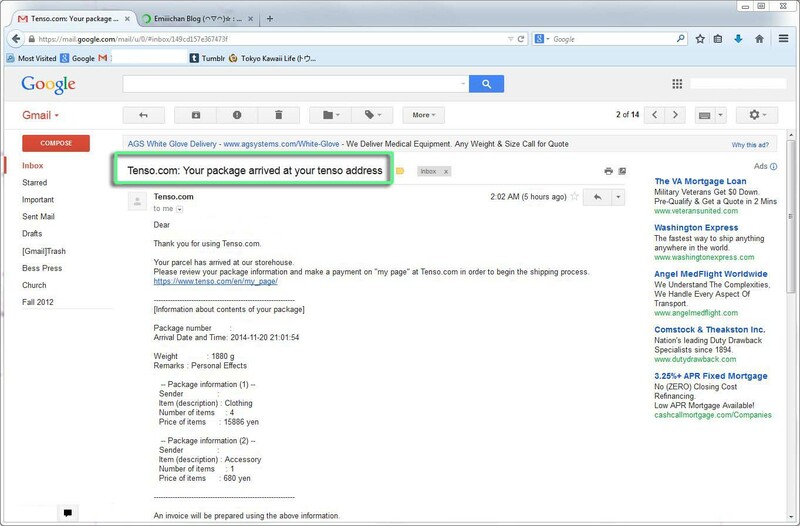 When I recently shipped with SAL, it took 7 days from the date I received the shipped email from Tenso to arrive at my house. 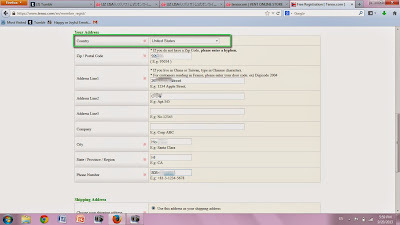 Variables include time at customs and the efficiency of your local post office as well as whether Sunday or other federal holidays are included during that time. Please feel free to ask for clarification on any of the points in the process. I will be happy to do my best to explain. If you notice any errors, please let me know! 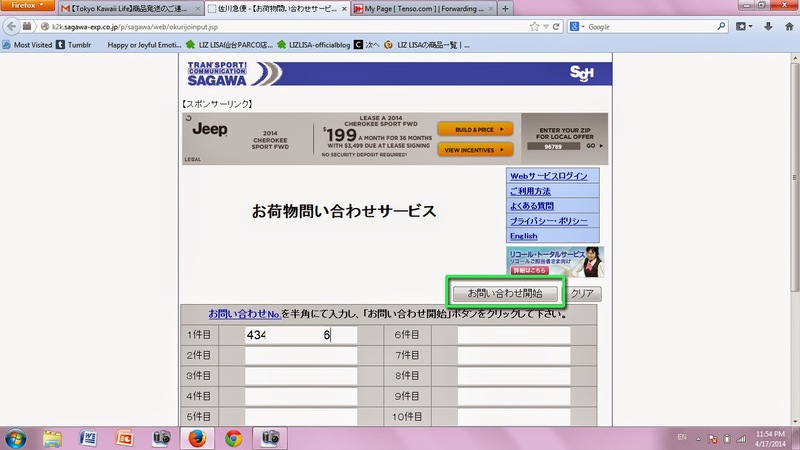 I am not fluent in reading or speaking Japanese and made this tutorial based only on past experience. 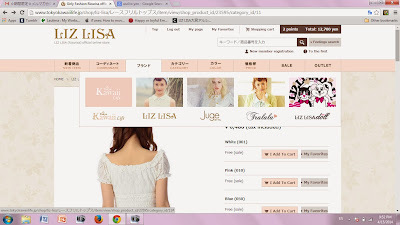 The basics of this process will also work for other Japanese online shops such as Ank Rouge. 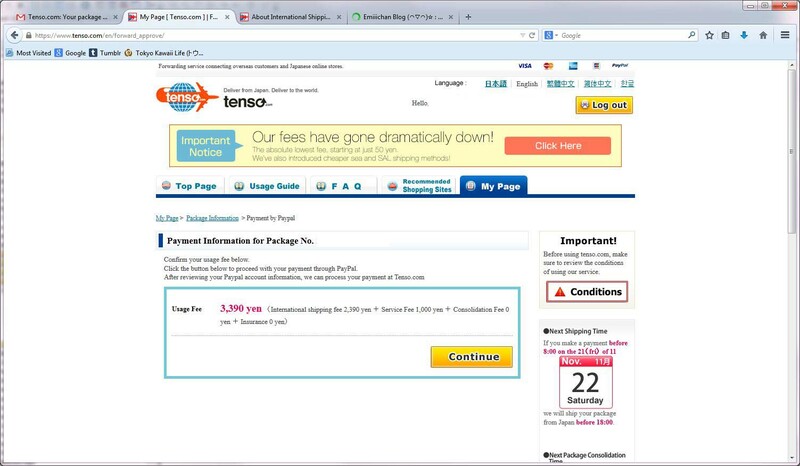 There are other business that do much of the same thing that Tenso does, but I personally have only ever used Tenso, and therefore can only speak to the reliability of its service and not others. If your credit card is getting rejected and you have ensured that you entered the numbers correctly, call your credit card company or bank. 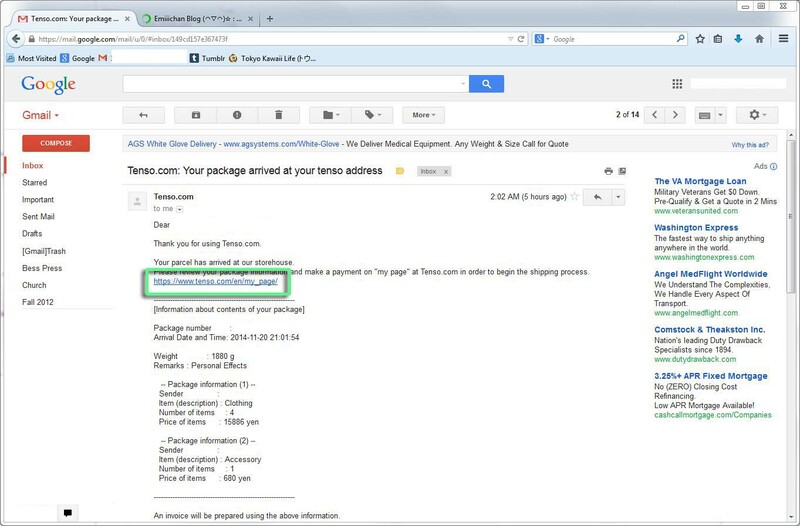 It may be the case that international transactions set off alerts as suspicious activity, and you will need to approve this purchase before being able to complete your order. If you plan on making more purchases in the future, considering okay-ing all activity with this company. 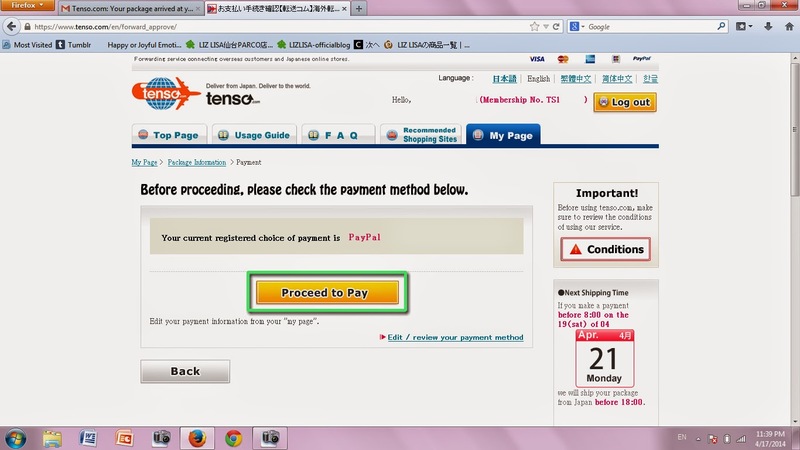 You may receive an email from Tenso asking you to submit proof of identity. I completed this over a year ago and do not remember the intricacies of the process. That being said, I did not experience any problems with it. Others have mentioned that it is not mandatory to complete, and they have been able to use the service satisfactorily without it. 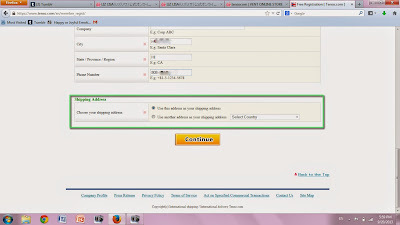 Unless you have personal issues surrounding your ID, I would personally suggest to complete the proof of identity on the chance that you may need to ship to an address other than your own with a time restriction, which you would not be able to do without it. 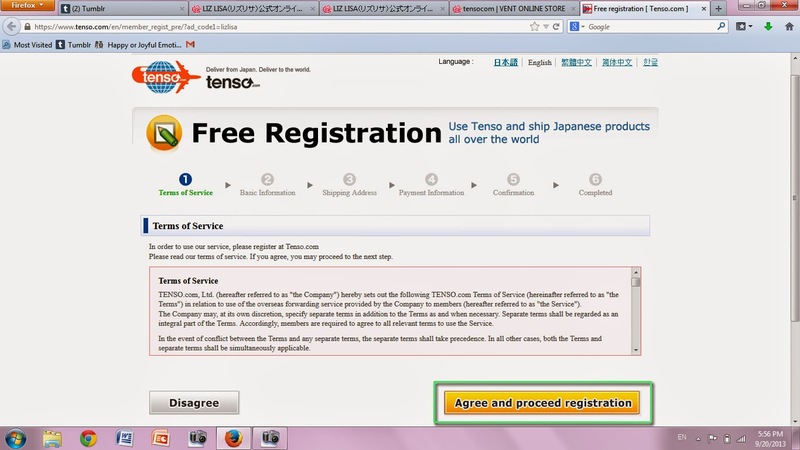 If you have any questions about this policy, please contact Tenso's support team directly. 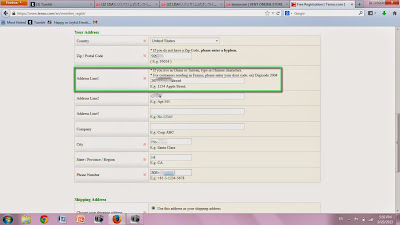 As I am not a Japanese resident and completed the process some time ago, I am unsure of the specifics and don't have my old email to look back on. 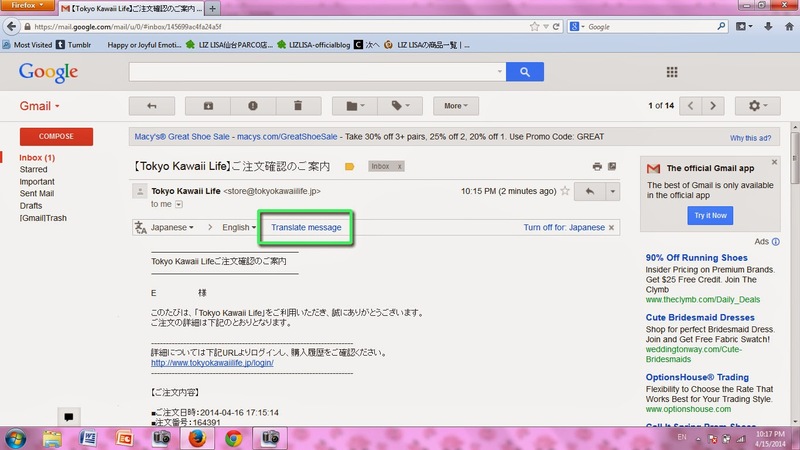 If you are having trouble with your order or using either Tenso or Tokyo Kawaii Life's services, please consider contacting them directly. Thank you for this, much appreciated! 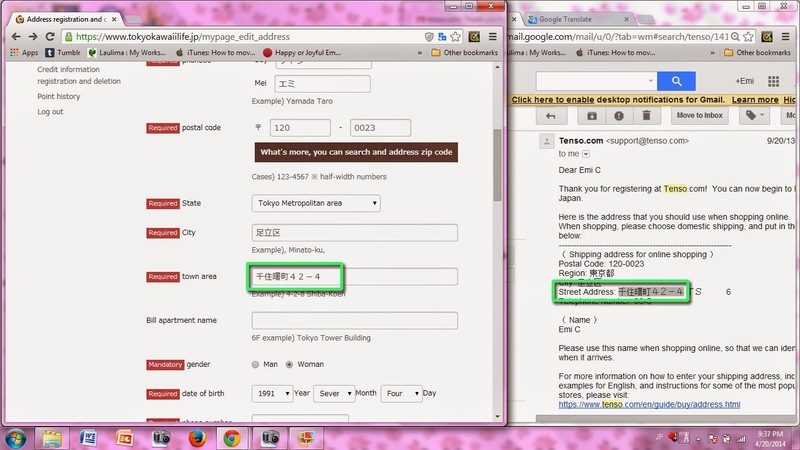 However, your TS number followed by 転送コムmight be better suited in the "company name" field instead of the "Bill apartment name". Also, your TS number is visible in the youtube video at around the 5:45 mark, just a heads up. Thanks for the tip! I'll make an edit note in a bit. I was actually a little unsure about that part, but it seems like it will be okay. 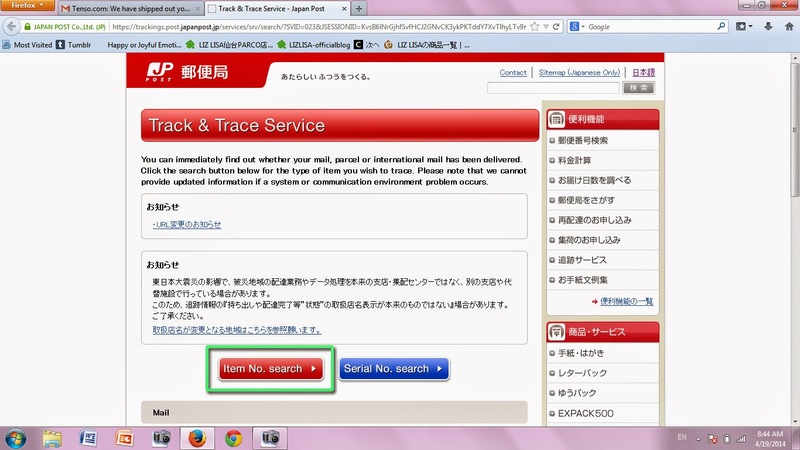 A friend in Japan told me that the post office isn't super picky but I'm not sure if that's true. This is basically how mine is entered, and I haven't had an problems yet (knock on wood). don't do this... 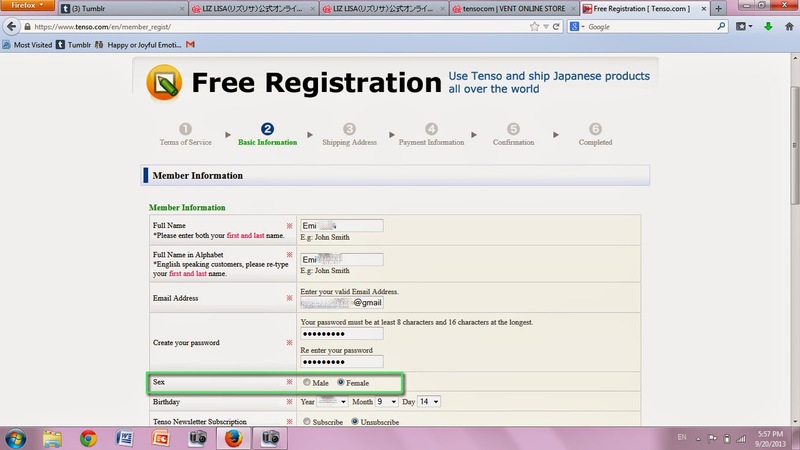 I had my Tenso number in the company name field and so it wasn't included with my address. Having your individual Tenso number on the package is really important, but since it wasn't in my address it didn't appear on my package. 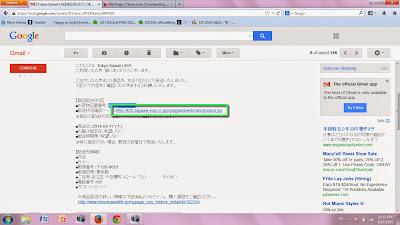 Since my number wasn't on my package, Tenso notified me that they received an "unknown package" (with my name on it) and I had to forward them the confirmation emails from my purchase to prove that the package belongs to me. This delayed the whole forwarding process. 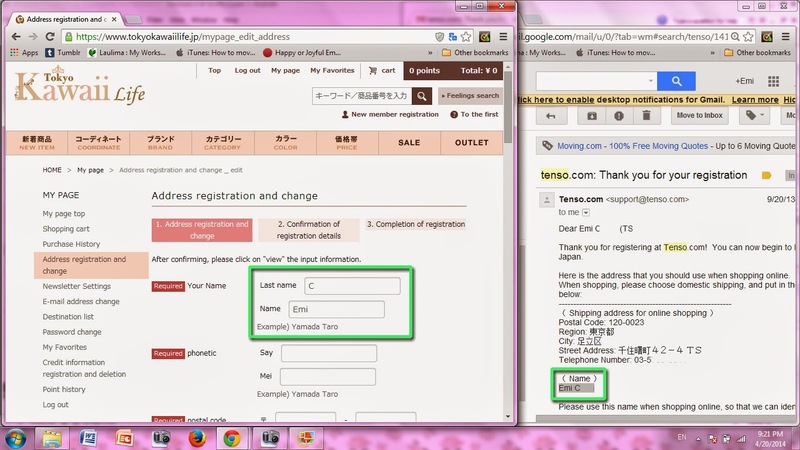 I sent them screenshots of how I entered the address on my account and was told to put my Tenso number followed by the 転送コム part in the address field, after the first part of the address. Hi. Just to be clear, what exactly are you advising? Is having the address as I identified it originally as the "Bill apartment name" the advisable method? I personally always use the method I personally posted about in my post and have yet to have had any issues with easily over 60 packages. 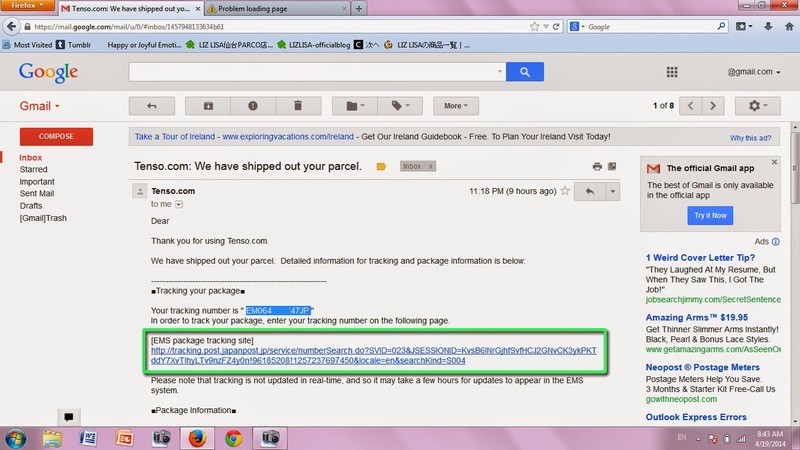 I am advising not to do what Lillium suggested, as it is incorrect and prolongs the forwarding process. I did what Lillium said and ran into trouble. 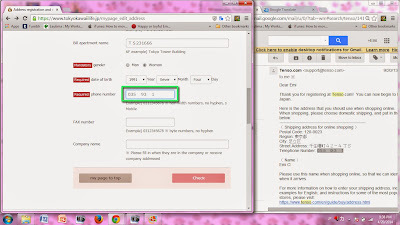 Don't put anything into the company name field, and put the Tenso number into the address/bill apartment name field. Hello, I'm sorry if you had already answer this question somewhere... but when Tokyo kawaii life does not offer free shipping, how much would it cost? Thanks! Hi, no problem. 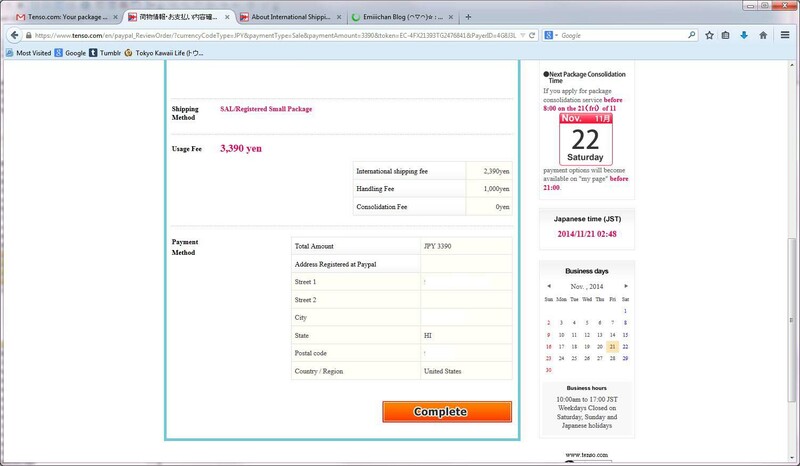 Before the switchover and tax increase, it was a standard 525yen. 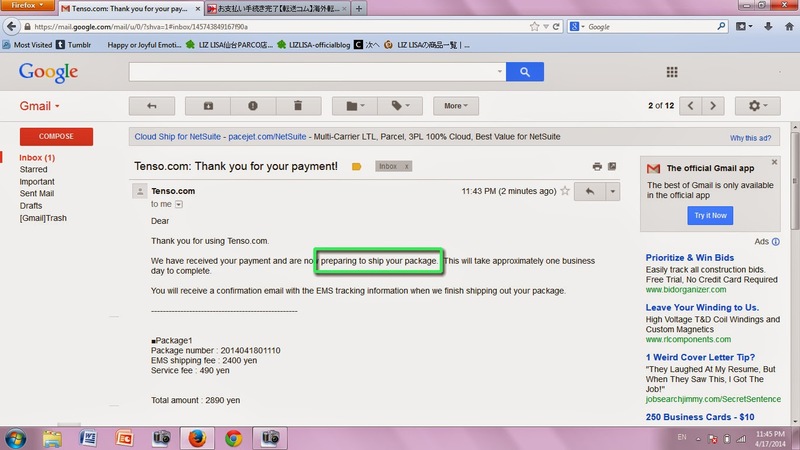 I actually haven't ordered from TKL without a free shipping promotion yet, but I would guess that it should be really similar to that. It will be listed when you check out though! Hi. Sorry no. 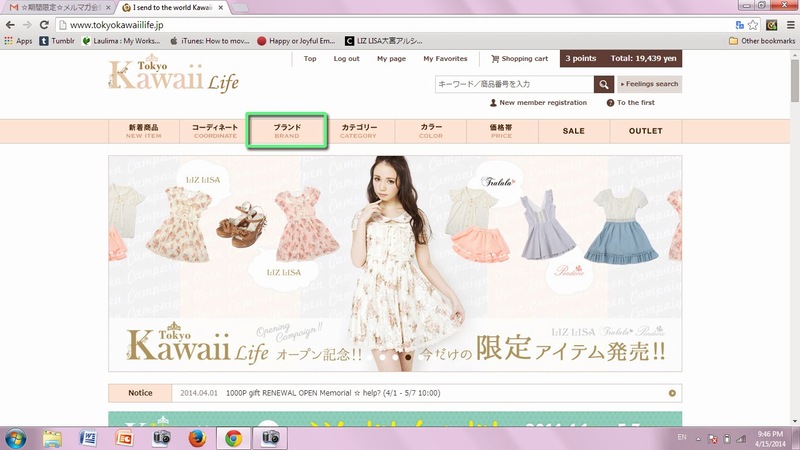 You cannot pay with PayPal with Tokyo Kawaii Life. 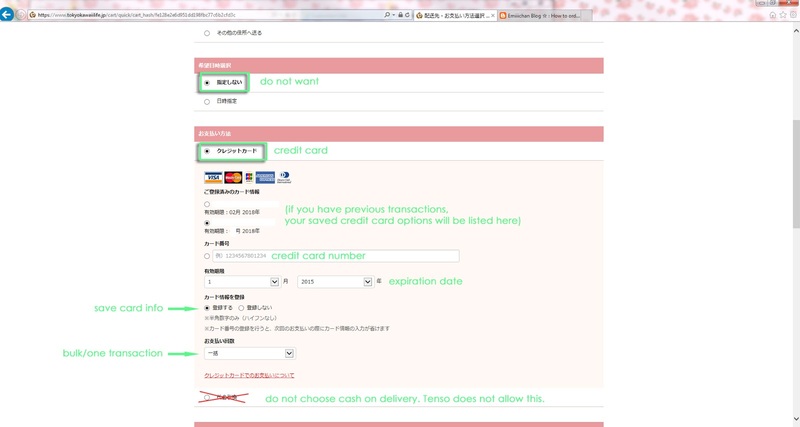 If you want to order from the website, you'll need to hire a shopping service that accepts PayPal instead. 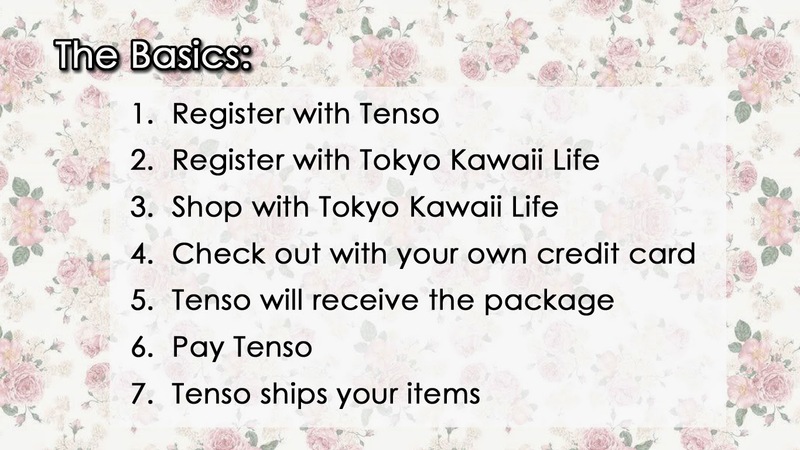 Personally, I hate using Tenso because it's probably one of the most expensive Japan shopping proxy services to use due to forcing you to use EMS and markups. 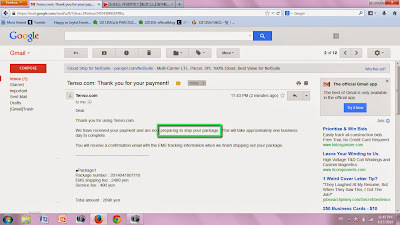 If you Google some, there a lot of shopping proxy services available for a much cheaper price. 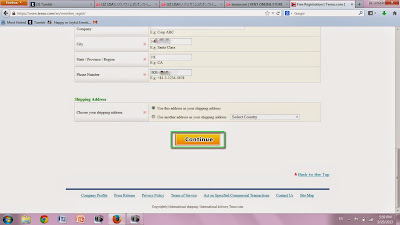 A lot of them also provide forwarding services as well. 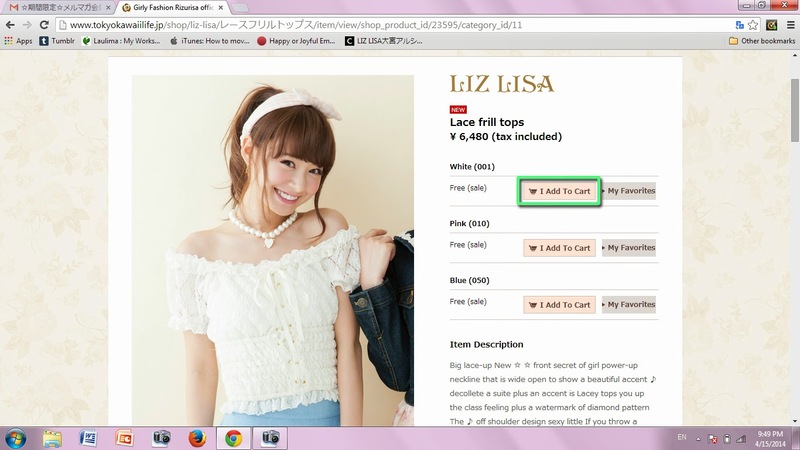 Note: It might be a good idea to ask if they buy from Liz Lisa though. 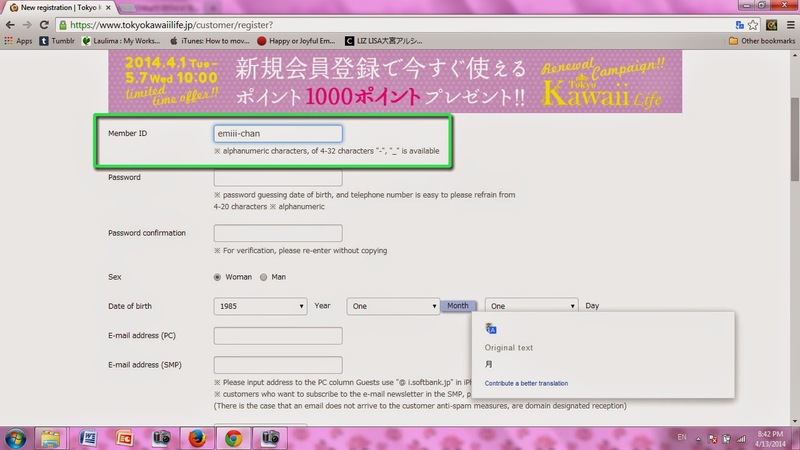 This is such a great tutorial Emi! I would say though that it is now required to confirm your identity with Tenso. 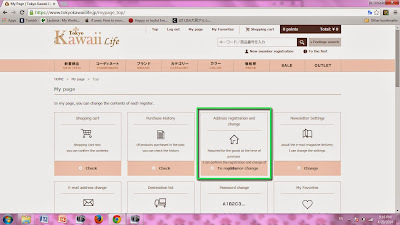 Apparently the laws changed in Japan sometime in 2014. 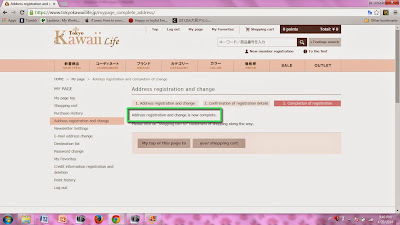 If a person was registered prior to the law change, I guess that they don't have to now provide it, but new registrations do. 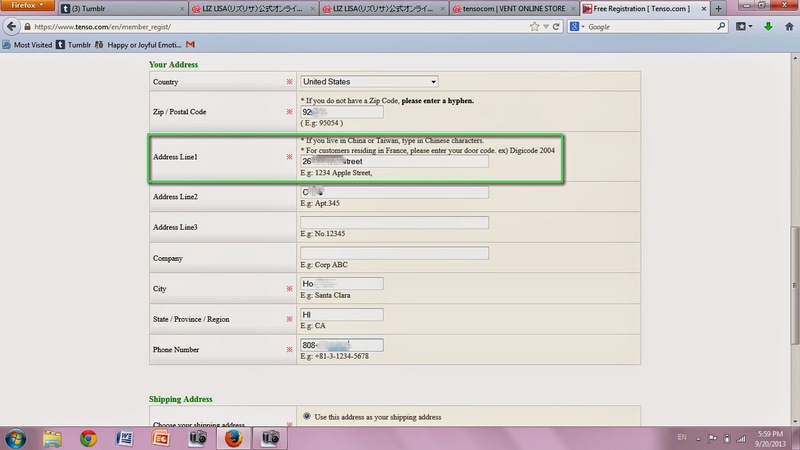 They will not ship to you until your ID is provided. 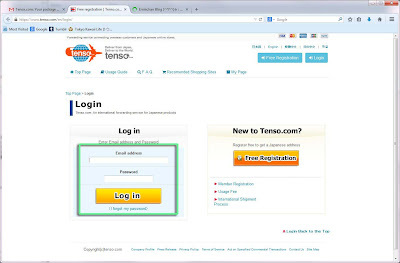 The big problem with this is that many people use their US driver's license (which makes sense because it is one of the only IDs that contain all the required information in one place - birth date, current address, full name and a photograph), and most US driver's licenses have the person's middle name or initial - but - in Tenso's online registration form, there is no field for a middle name or initial. 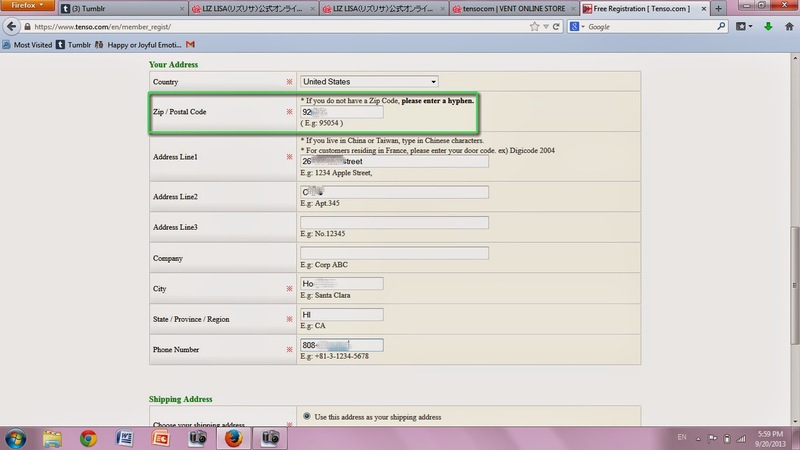 So, when they receive your online form and compare it to your copy of your DL, they don't match. 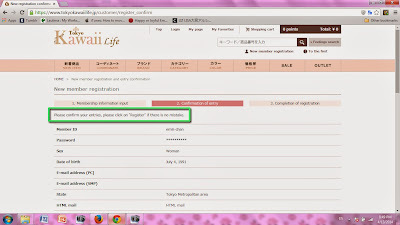 And yes, they will send you a notice that your ID and online registration form do not match. 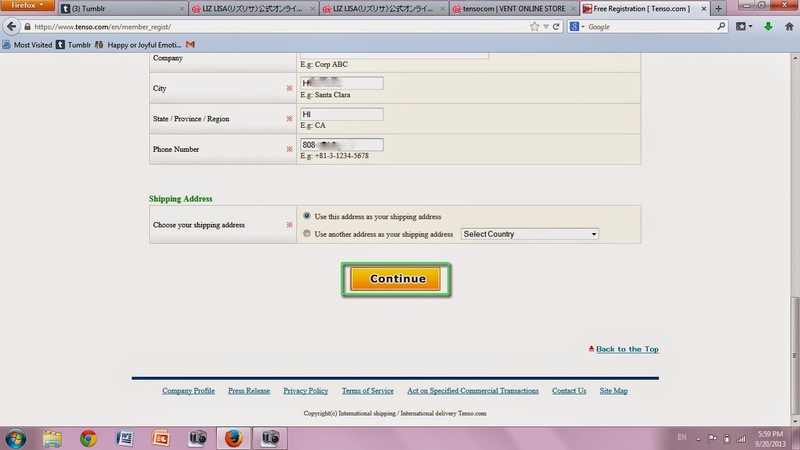 >_< Until this is remedied, they won't ship to you. 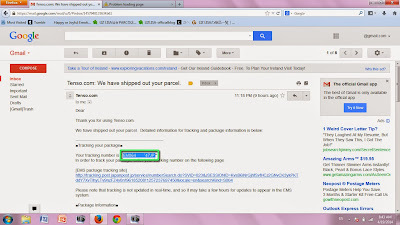 I had to contact them multiple times, and unfortunately, my e-mails were not replied to. 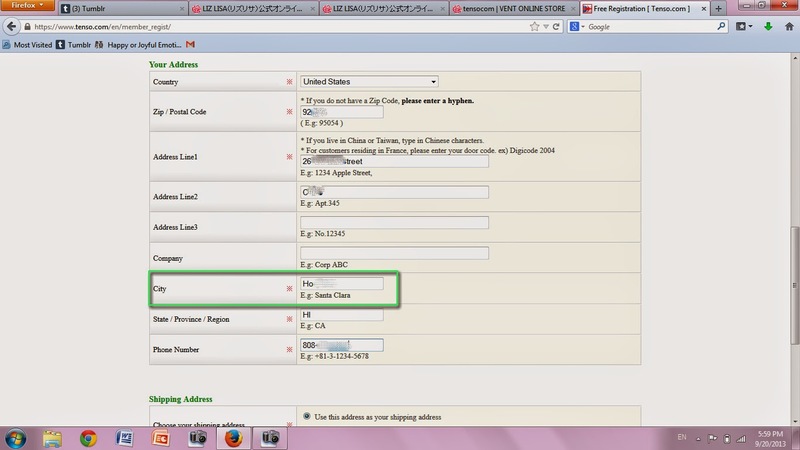 So, what I did was hyphenate my first name in the first name field to include my middle name. This worked. 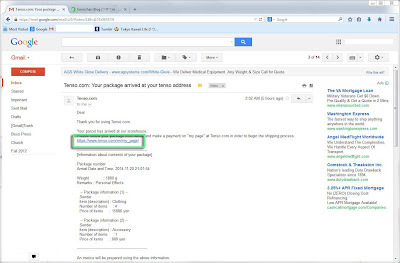 I didn't expect it to, but after I did it, I got a confirmation e-mail saying my ID had been 'verified' and reconciled with my online application and that I could now pay for my pending packages. Thanks for providing this information. I actually have a note about proof of identity at the bottom. I didn't have any such problems with my US driver's license and submitting the proof of identity and I actually have two first names and two middle names (but just one last name) which usually makes things extra difficult for me but it wasn't. Not sure why it was such an issue for you. Perhaps they are more strict now? I submitted mine back when they first started asking for it and don't remember exactly what I did. (But just remember it being really simple.) You do still have to go through the process if you were previously registered btw so they're not just picking on newcomers. 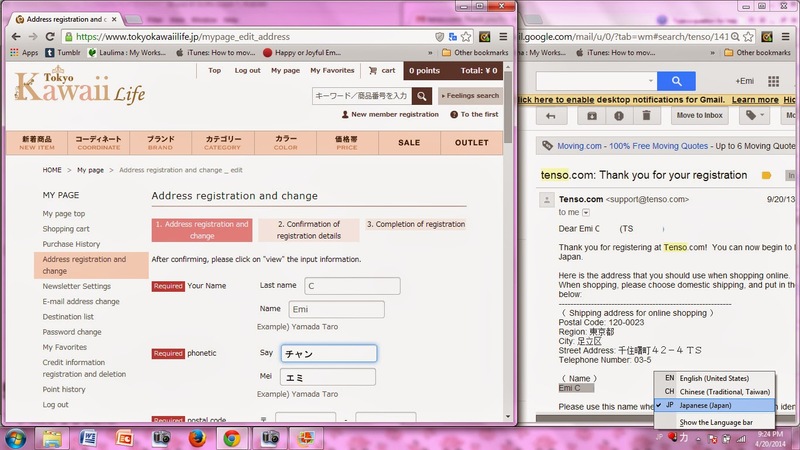 I also had several people who told me that Tenso *would* ship your packages without the proof of identity but only to one address. Not sure how true that is now either. I guess they keep changing it. Hi Emi, thank you so much for this very helpful guide. 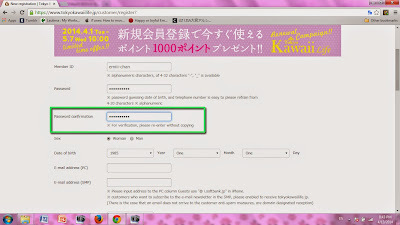 I just signed up with both tenso and tokyokawaiilife except I seem to be having major problems with tokyokawaiilife :'( I don't know if the website just hates me or I am doing something wrong lol T_T I followed every direction carefully and when I click on the current "secret obon sale" it takes me back to the member login page (although it says I'm already logged in at the top because it says logout for me). Yet, I tried to log in again anyways and then it just takes me back to the same login page over and over as if my log in information is incorrect. So then I decided to logout and log back in, it works fine. So I tried to click the secret sale banner link again, same problem occurs. 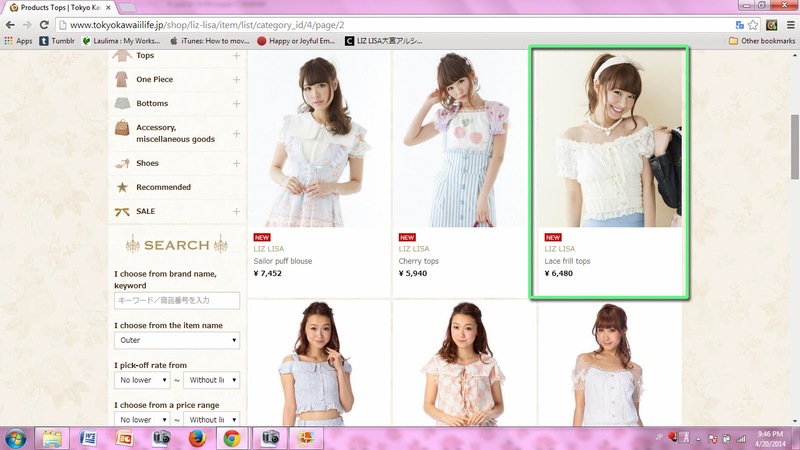 After trying a few times with same results, I noticed the site seems to have broke down on me...When I try to click on any of the tabs to browse clothes like sale and outlet, it just takes me to a blank page that will not load. 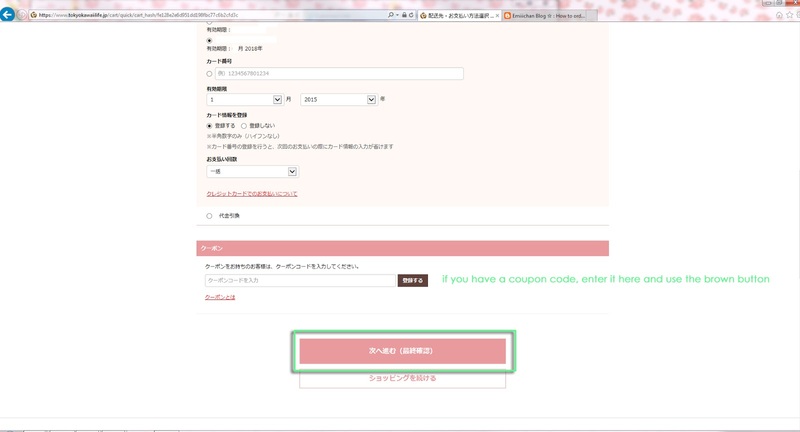 I had no trouble browsing the site prior to signing up T_T Any ideas of what is going on? Hmmm no, sorry, I have no idea what's going on. I was actually just generally browsing the site (including the secret sale but also just the regular pages as well) this morning and even a few minutes ago after receiving this comment while logged in and continue to have had no problems...The only thing I can think of is your browser or a virus tracker constantly kicking you out? Or even just a regular virus? But I'm really not sure and haven't heard of this problem before unfortunately. You can try emailing the website but I don't think it's a general problem (that many many people are experiencing that I know) and it might be specific to you, but I'm not sure if there's any relation to you creating an account since I think most people use it with an account as well. Sorry I can't be of more help. Success! It works. Thanks so much Emi! From your suggestions, I realized it probably didn't work because I had no scripts on lol so when I turned it off, it works. 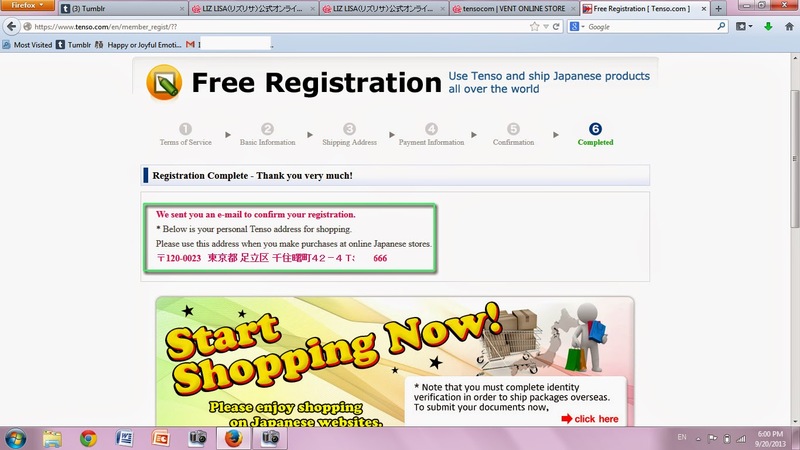 So excited to start shopping now muhaha once I finish verifying my ID and stuff with tenso haha. 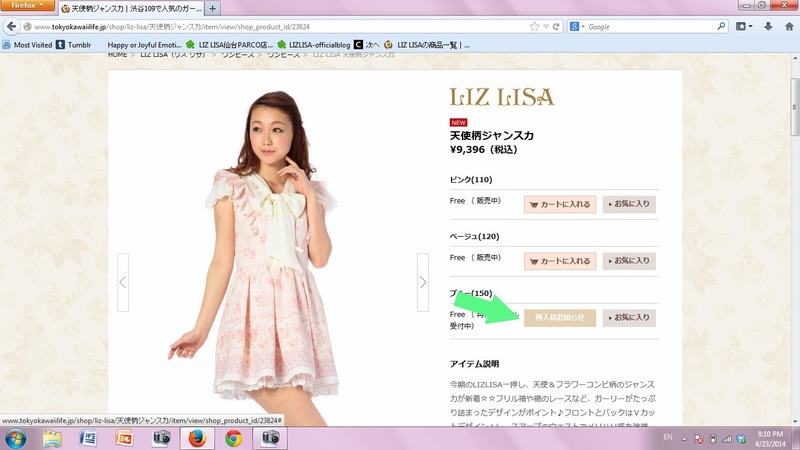 Btw, did you know the website otakumode.com sells Liz Lisa O_O Do you know if it is authentic? 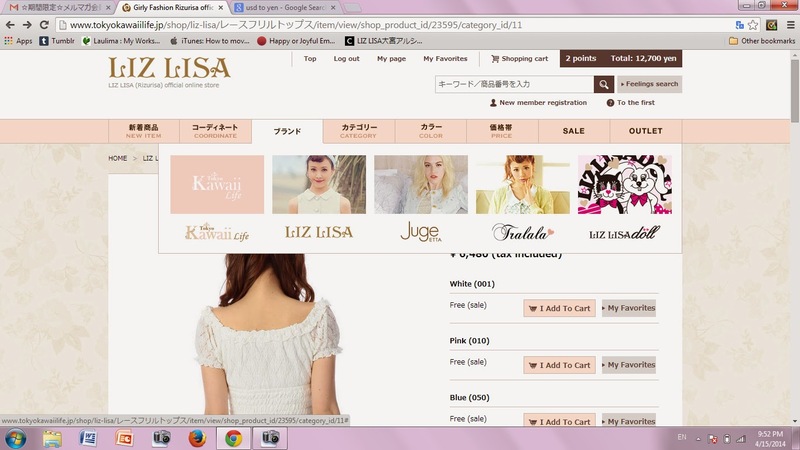 It isn't listed in Liz Lisa's official retailers, but MaruQ isn't listed on there either and I believe it is legit. 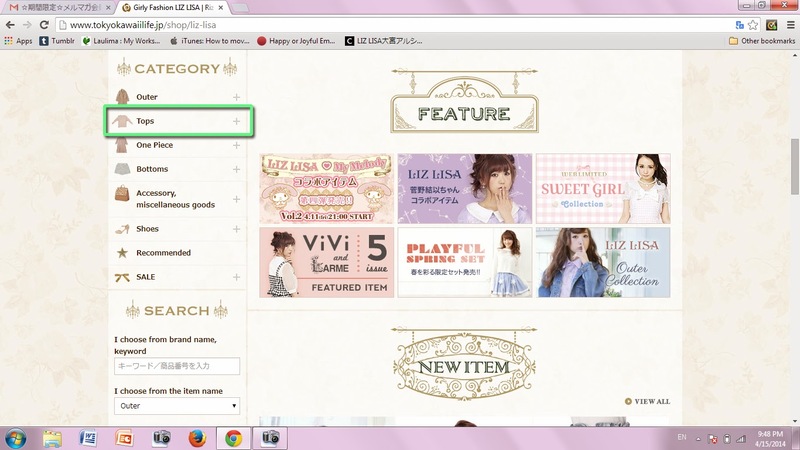 Not sure about otaku mode though...It's tempting because I see some sold out items I want . 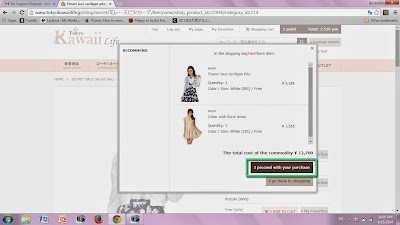 I know of the website but I personally do not support it or wish to purchase from them any time soon. There are a number of sites that sell authentic Liz Lisa but are not actually official Liz Lisa retailers. 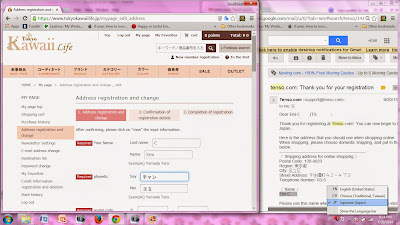 (Of course there are also a number of sites that do not sell authentic as well lol.) It just kind of comes down to whether you trust them or not and whether that's where you want your money going. I don't really have anything much further on the subject and don't even want to link them anywhere in my blog personally tbh. Not really interested in being associated with them in any way. Thank you for your honesty and help! I really appreciate you taking the time to answer my questions as well as making these tutorials and guides. I also love your Youtube videos. 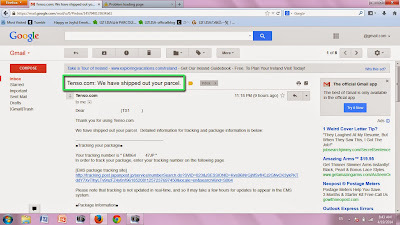 Keep up the great work :D looking forward to your next haul video. Thanks! Hopefully I can get it up in the next few weeks! Hello! 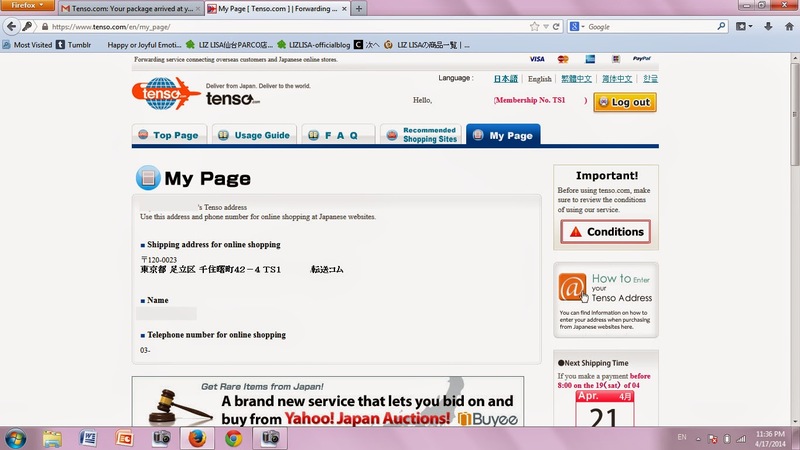 If you want to access tenso.com in English, you should go to http://www.tenso.com/en/ directly :) Hope it helps. 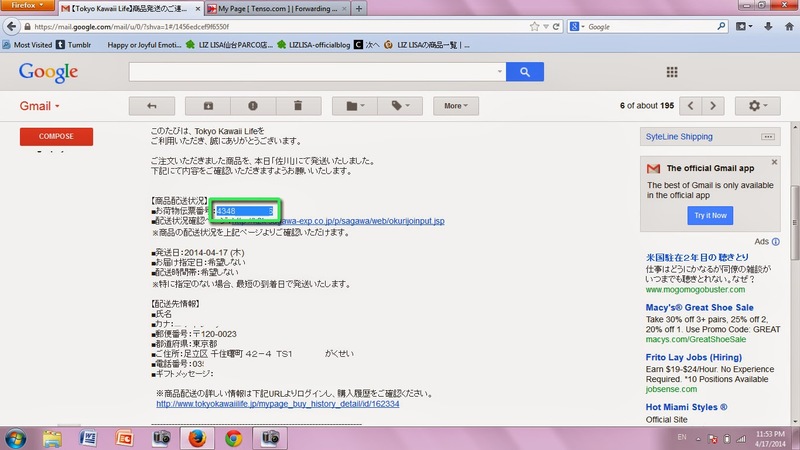 I have that link at the top of the page. Thank you. 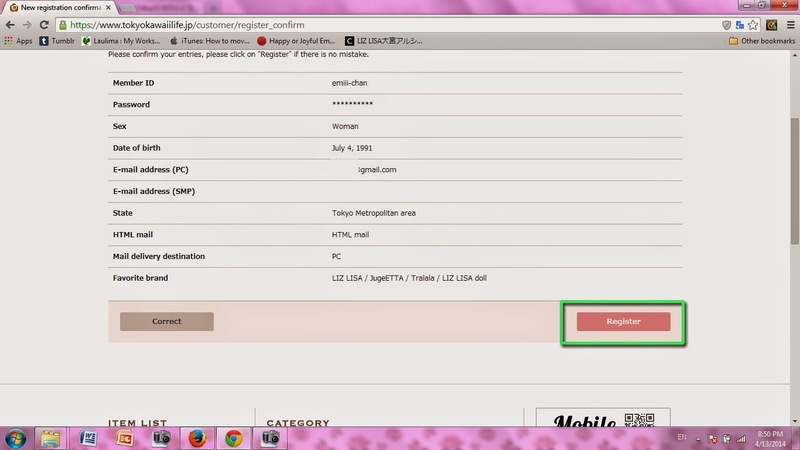 Hello, thank you very much for your tutorial. 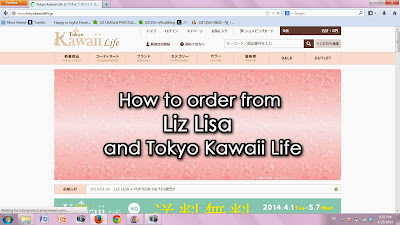 I bought something in Liz Lisa's online shop and i think i did it right, but it passed 11 days since my purchase is in Adachi's office and Tenso didn't send me a email for shipping yet. Is it normal? No, that is a bit unusual. 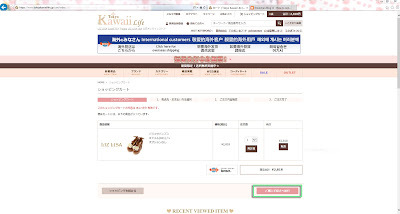 Usually Tenso will register my package in 2-3 business days after it is shipped from Liz Lisa. My advice would be to check your spam folder or check your Tenso account directly. 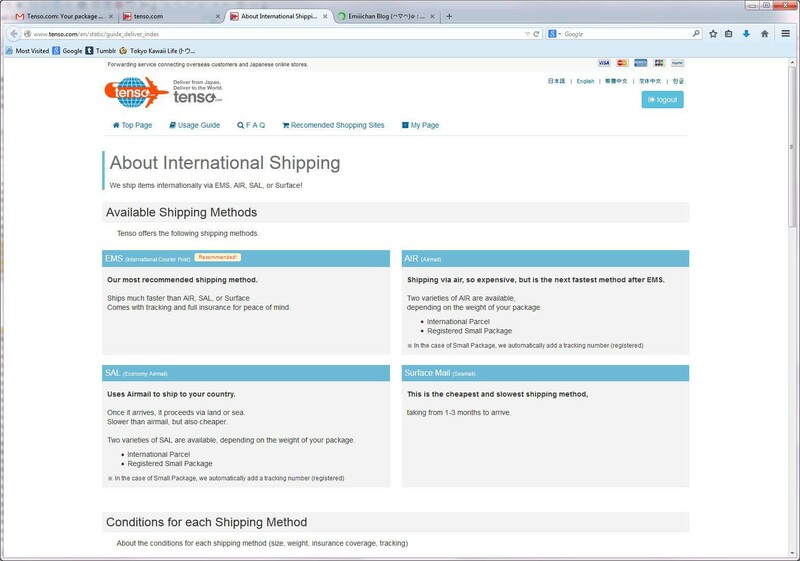 If the package successfully arrived at Tenso, it should be waiting to be processed under your "International shipments" on your "My Page". Okay, thank you very much for your reply. 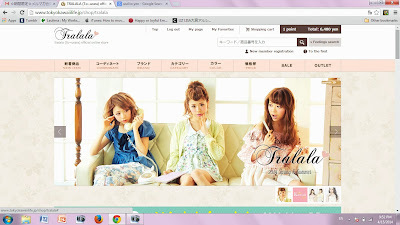 I will contact them. I didnt read everyones comments/questions so please forgive me if you have answered this already. 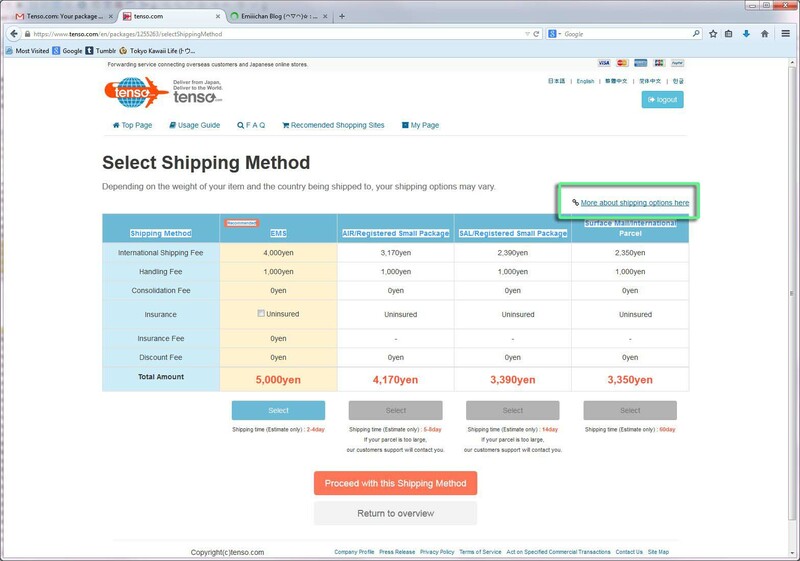 There may be a domestic shipping fee from TKL to Tenso (540yen) if you do not meet the minimum purchase amount for free shipping and/or there is no free shipping promotion. This time is, as you will find a Tokyo Kawaii Life, Thank you very much. 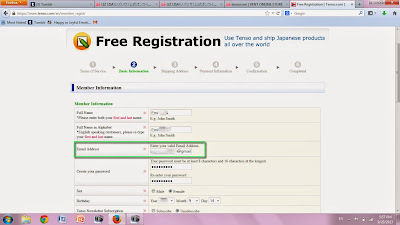 Since the member registration process was completed we guide. 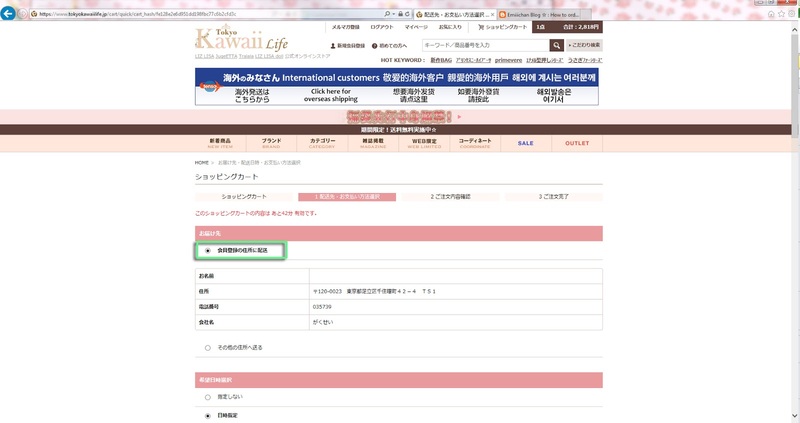 It should be noted that, in the shopping, such as the delivery destination, you must have your registration of customer information. 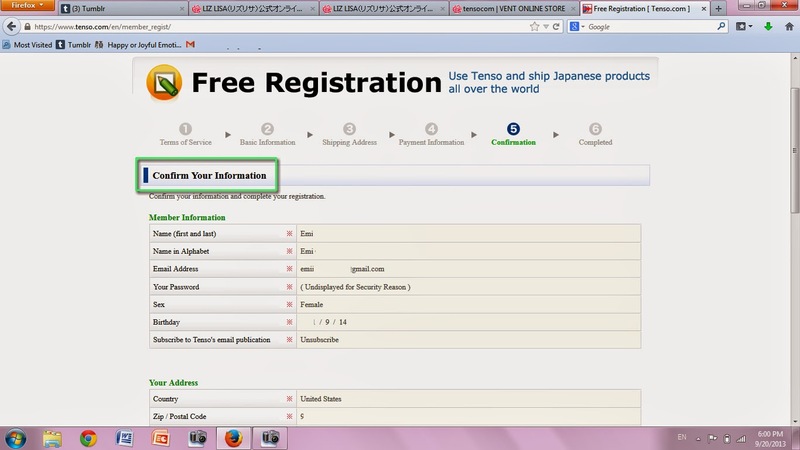 From the customer information following URL you can register. 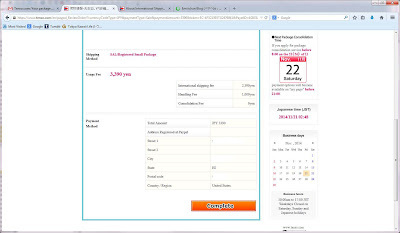 In the future, we will quickly deliver, such as new products and deals by e-mail magazine. 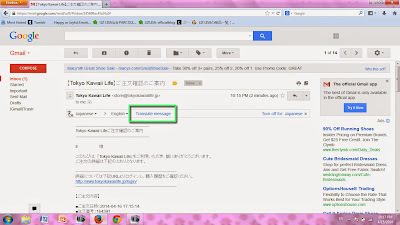 ※ This e-mail I have indicated the important information at the time of order to use the Tokyo Kawaii Life. We hope that you will carefully manage and save. We ask that you please keep it. 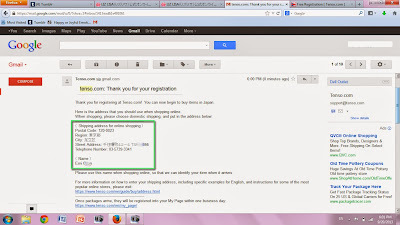 And change of registration details (e-mail address changes, etc. ), thank you from the following URL. 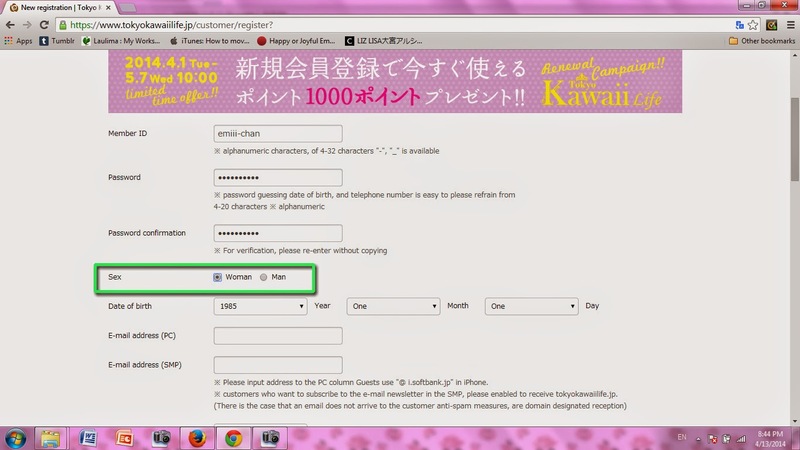 On top of the available membership ID · password, please login. 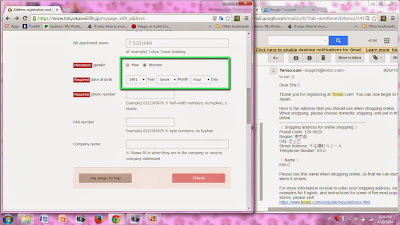 Please refer to from the following URL. 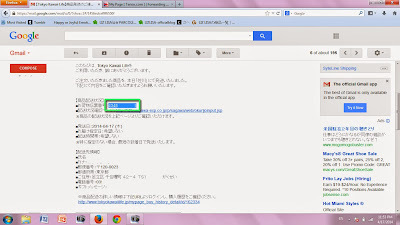 In the absence of your idea to this e-mail, sorry to trouble you, but please give me connection from the following form. 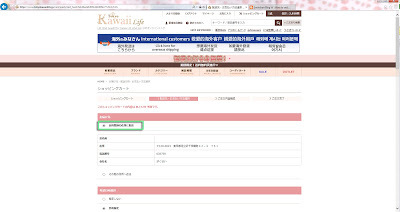 Please understand that even if I reply that it can not contact us. 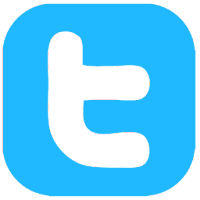 Please contact us from the following "Customer Contact Us". 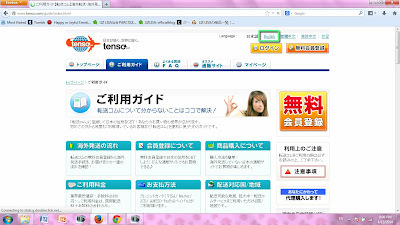 ※ If you sandwich the Saturdays, Sundays and public holidays, there is a thing to get time in the corresponding. Thank you the Tokyo Kawaii Life in the future. COPYRIGHTS @ 2017LIZ LISA CO., LTD. ALL RIGHTS RESERVED. 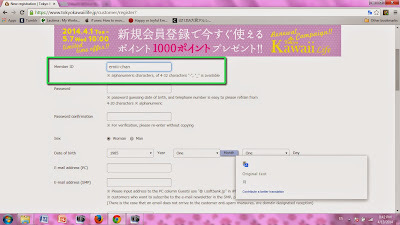 Tokyo Kawaii Life has since made changes to a few of the email details as I created this tutorial in 2014 and unfortunately don't constantly sign up for accounts to update mundane bits of this. 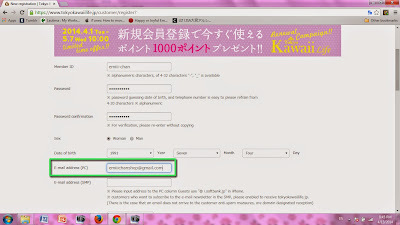 It's up to you if you want to sign up with Tenso or not, but Tokyo Kawaii Life does not ship overseas which is why a forwarding service address (like one provided by Tenso) is necessary. The email is basically asking you to update your customer information. If you have an alternative to the way I have shown in this tutorial, please do not feel limited by it. So I'm guessing the answer to this is yes but can you keep a package at your tenso address for awhile before having them ship it in case you don't have the money to buy something and ship it internationally at the same time? Yes, but there is a time limit. What if you forgot the 転送コム? 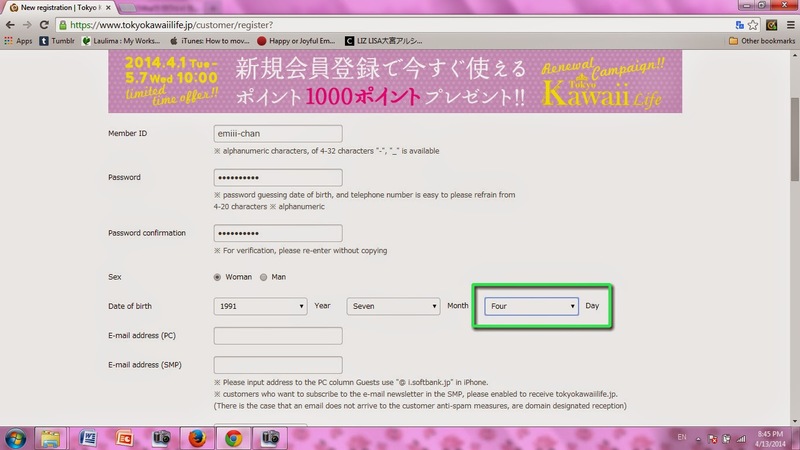 I just entered TS and the following numbers when I registered my address for Tokyo Kawaii Life. I didn't have it entered for a while and it was fine. 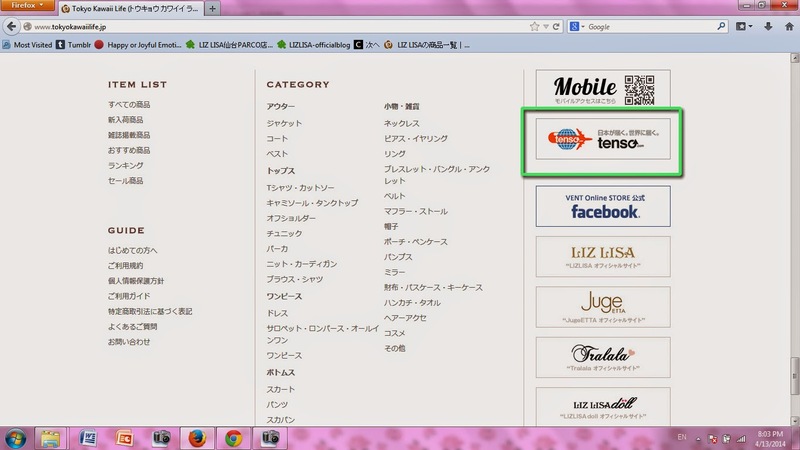 That's basically just to identify Tenso as a forwarding service. 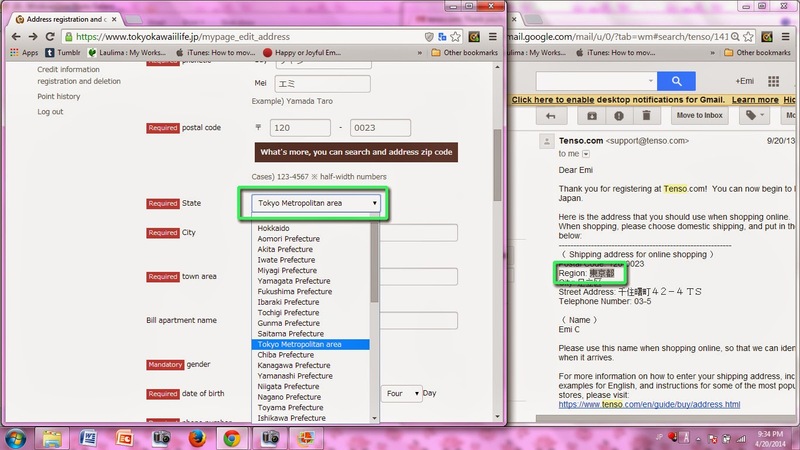 You can always edit your address to add it if you want to. 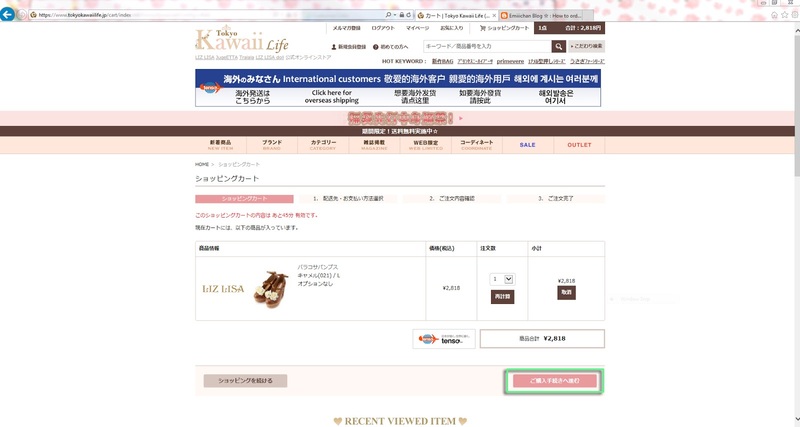 How long does it take Tokyo Kawaii life to ship items out? 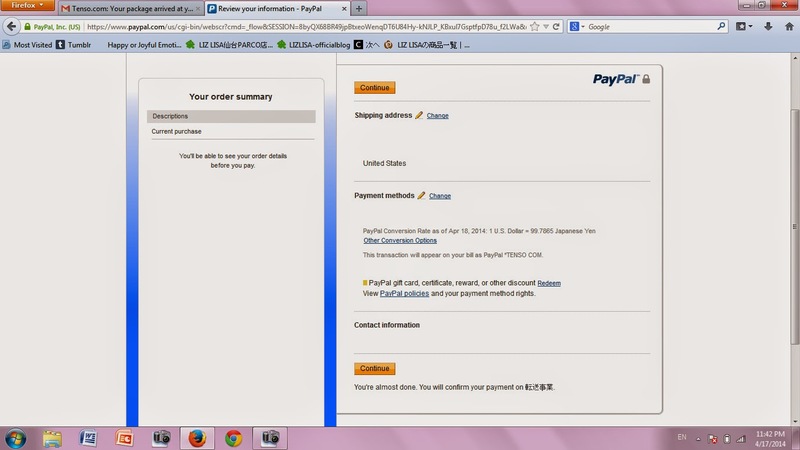 Some of the items I ordered were pre-order. It’s been two days and they’ve still not shipped anything out. 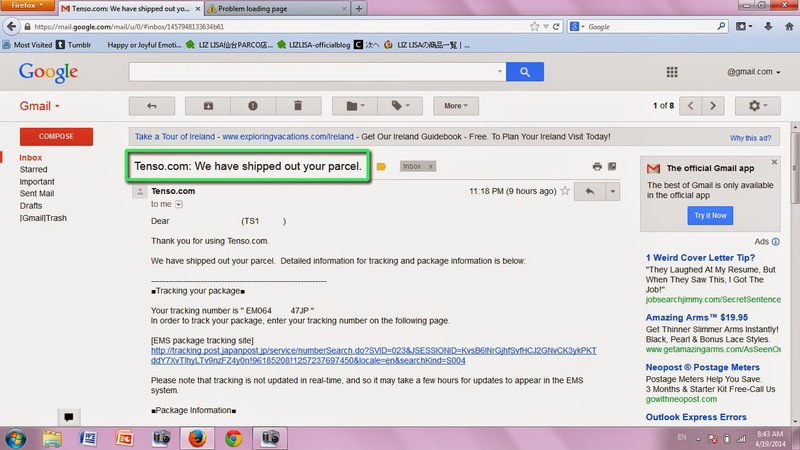 TKL usually ships items domestically within 1-2 business days. 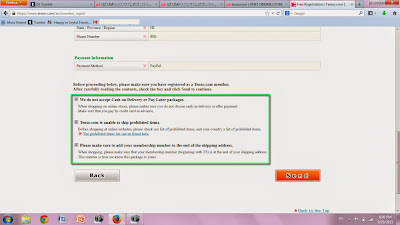 However, pre-order items do not ship immediately and have a delayed fulfillment date (hence the pre-order). 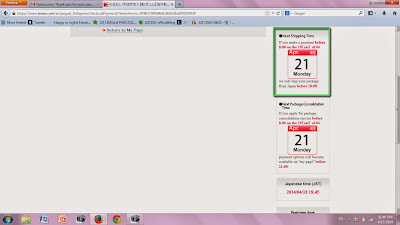 When your pre-order items will ship depends on when the actual release date is. For example, for most of the current Cinderella series items, the release date is 10/14, so you can expect them to ship 10/13- 10/15 depending on your time zone. If I ordered one preorder and a couple regular orders does Tokyo Kawaii Life combine them together and ship out on the preorder date? 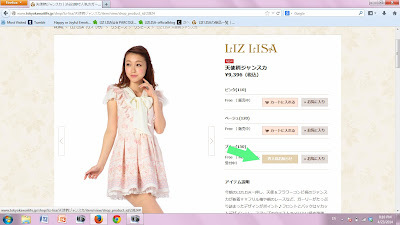 Liz Lisa (etc) wardrobe master post! Purchased / In the mail!